Beacon of hope. 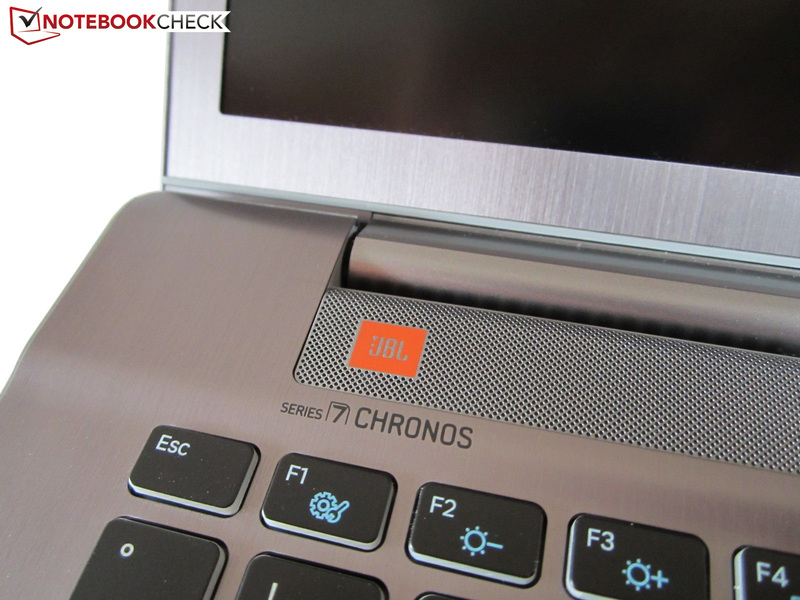 The Series 7 Chronos 770Z7E definitely belongs to the most exciting and most awaited multimedia laptops of 2013. The main attraction is - depending on the view - either the slim metal chassis or the integrated 28 nm GPU. AMD's Radeon HD 8870M competes with Nvidia's powerful Kepler architecture. 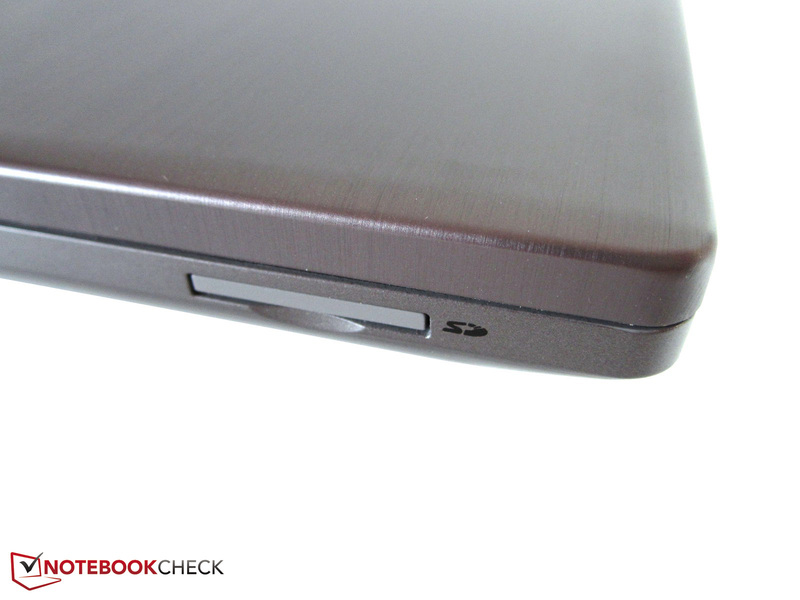 We took a detailed look at the 17-incher. 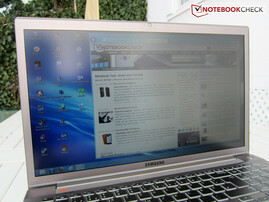 Users looking for a high-performance yet not too bulky multimedia device should look at Samsung. 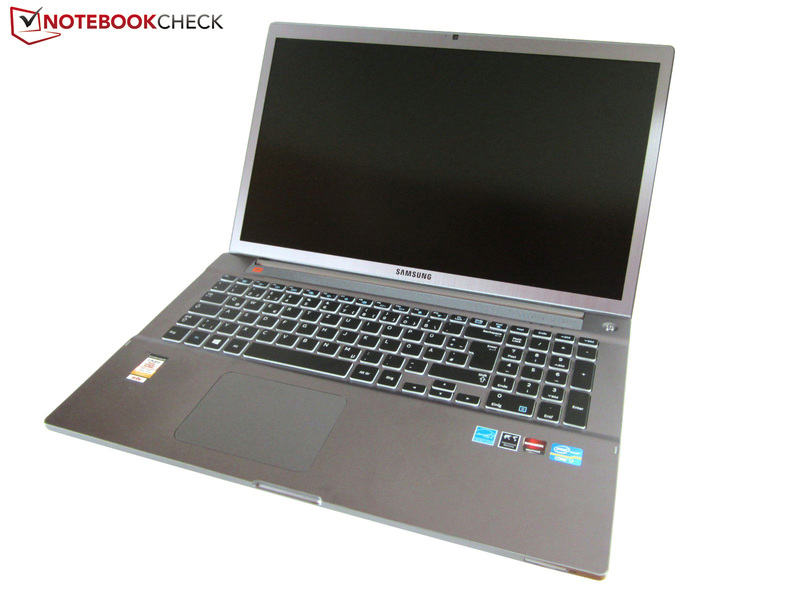 With a price of over 1200 Euros (~$1566), the Series 7 Chronos 770Z7E is not exactly aimed at price-conscious buyers. 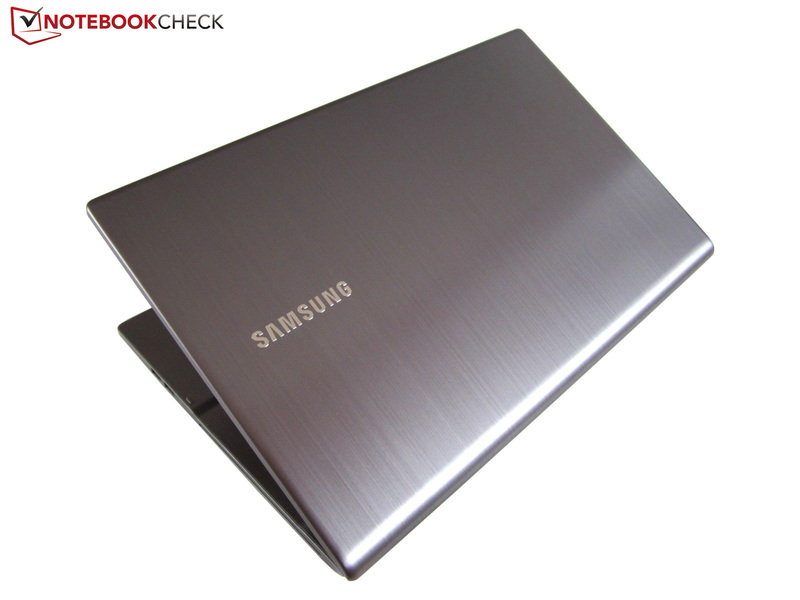 However, the elegant casing and strong hardware make the laptop very attractive. This review is based on the 770Z7E-S01DE entry-level model that is currently priced at approximately 1250 Euros (~$1631). Like its more expensive brother, it features a non-glare Full HD screen, DVD burner (only the S03DE sports a Blu-ray drive) and a quad-core from Intel's latest Ivy Bridge generation. Depending on the load, the Core i7-3635QM achieves between 2.4 and 3.4 GHz. A cutting-edge DirectX 11.1 accelerator is also part of the bundle. The Radeon HD 8870M is based on AMD's energy-efficient GCN architecture and sports 2048 MB of GDDR5 video RAM. 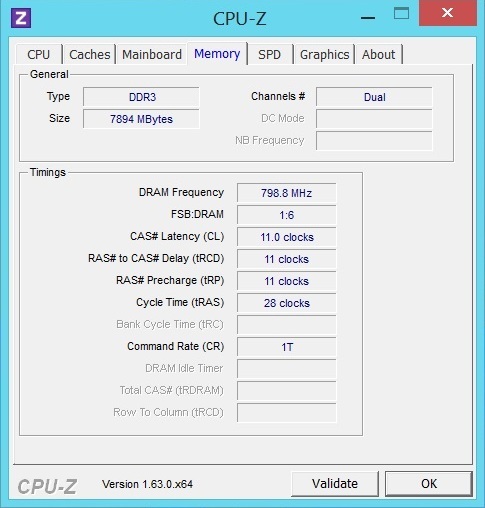 8 GB of DDR3 RAM (1600 MHz) and a 1000 GB HDD (5400 rpm) are also decent. 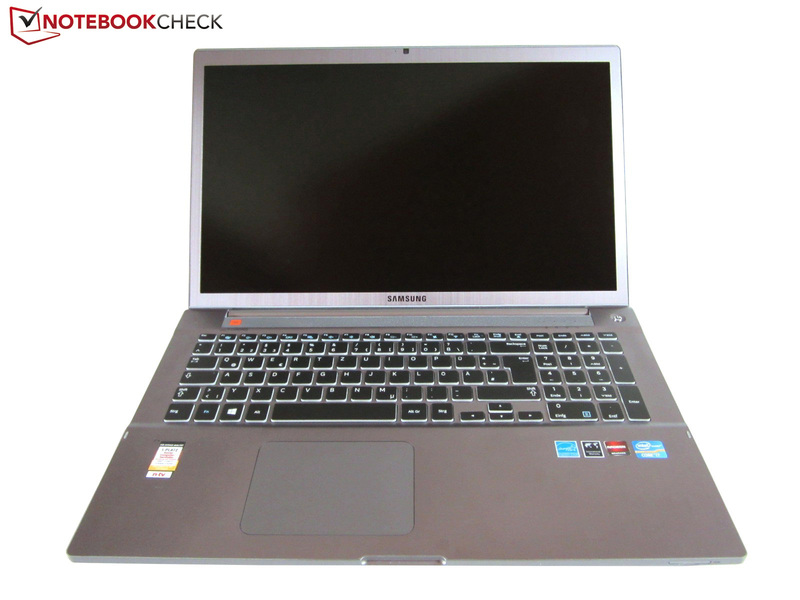 The manufacturer relies on Windows 8 64 bit as the operating system. The nearly 300 Euros (~$391) more expensive 770Z7E-S02DE features a small 128 GB SSD instead of an HDD and runs on Windows 8 Professional Edition. The premium models S03DE (~1600 Euros, ~$2088) and S04DE (~1750 Euros, ~$2284) feature between 12 GB of DDR3 RAM and a large 256 GB SSD. The more expensive versions are throughout interesting since a solid state drive makes itself noticeable in practice and accessing the hard drive slot is only inconveniently possible. The Chronos 770Z7E's exterior corresponds to the 700Z7C reviewed half a year ago. Besides the successful looks, it is the high-quality materials especially that make a great first impression. 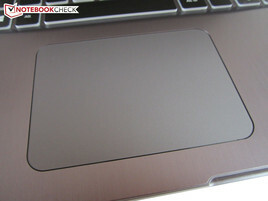 The manufacturer not only uses brushed aluminum for the lid, but also for the display bezel and for the keyboard area. The casing's plain base, which also gleams in a silver-gray color, proves to be plastic. 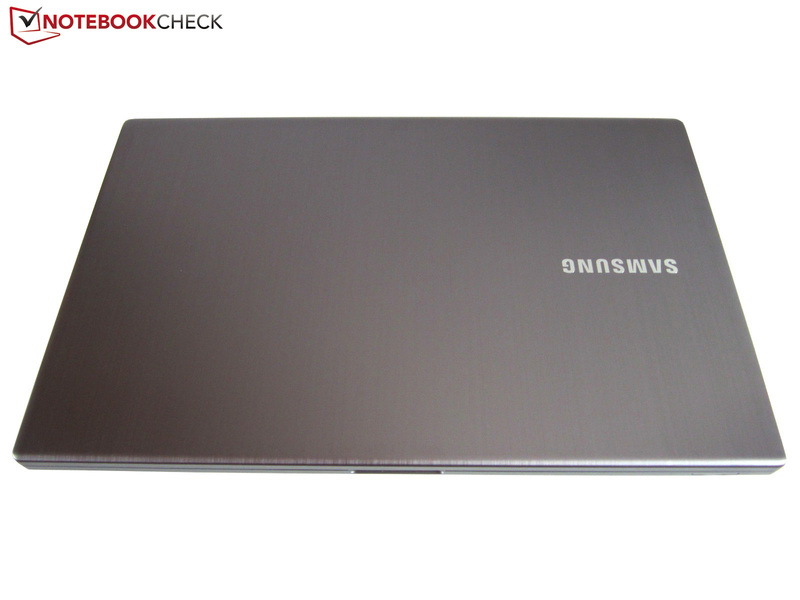 The laptop is quite resistant to smudge due to the lack of high-gloss components and dark colors. Fingerprints are no issue for the 770Z7E. 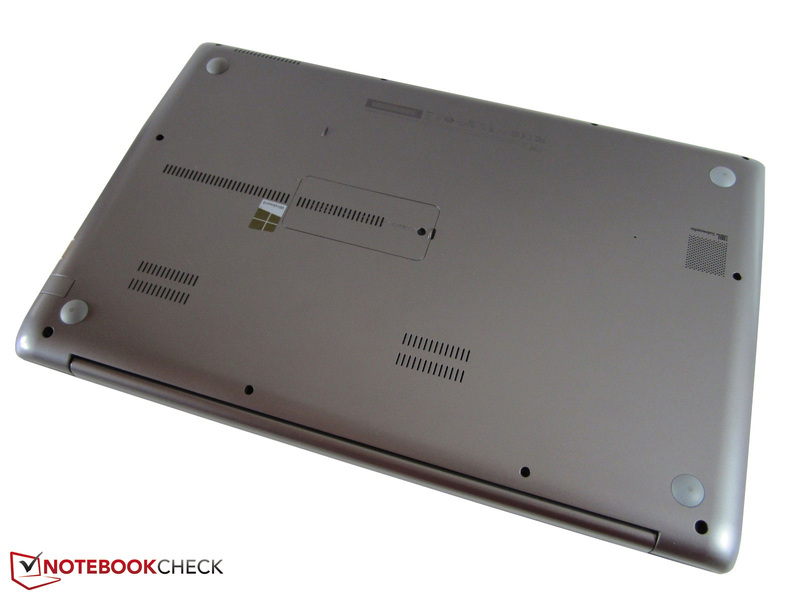 With a weight of three kilograms, the all-rounder belongs to the light 17-inch laptops. Asus' N76VZ (GeForce GT 650M) for example weighs 500 grams more. Further bonus points are given for its moderate size. Most contenders clearly surpass the height of 27 millimeters. 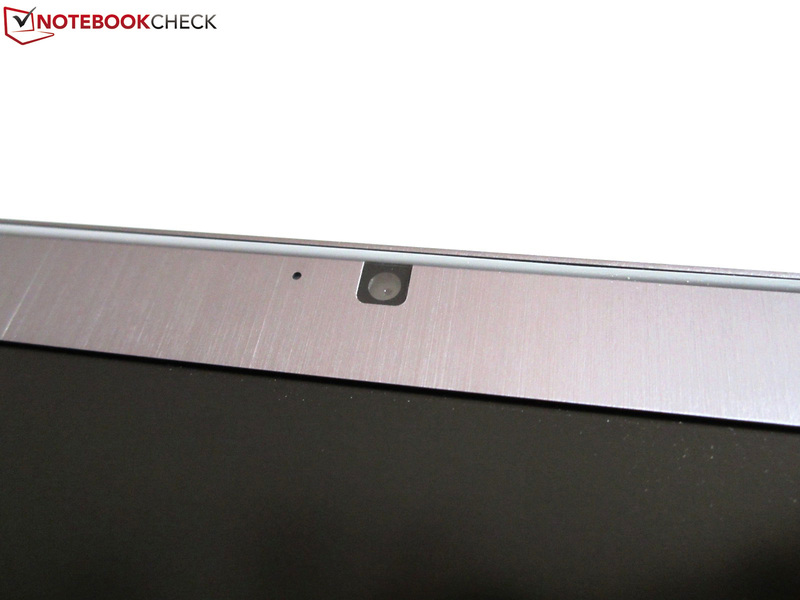 For comparison, the aforementioned Asus N76VZ is almost one centimeter thicker. The build makes a mixed impression. While the base unit is beyond reproach, the lid exhibits weaknesses. For example, the transition to the display bezel was uneven in our test device. Not only do the fingers notice this, but it can be seen from a slanted angle when the display light shines through it. The 770Z7E unfortunately just misses a very good workmanship rating due to this flaw. The same is true for stability. 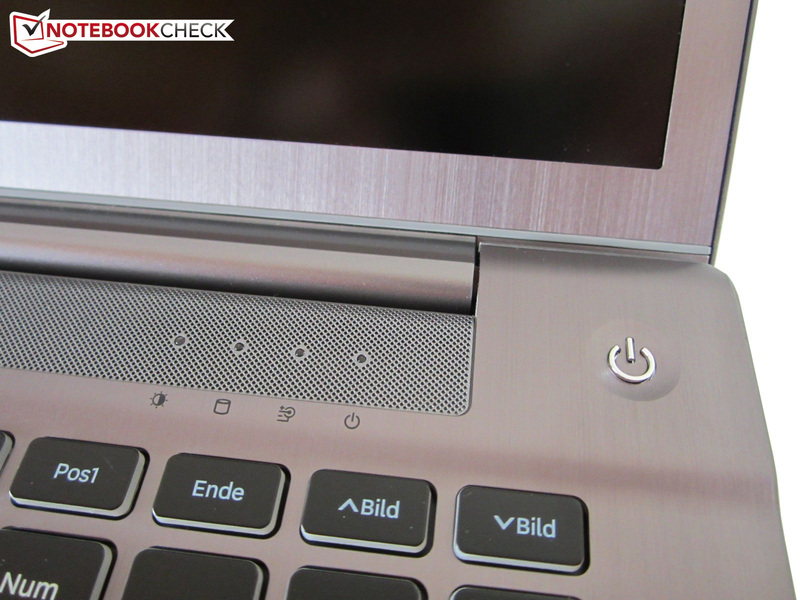 Unlike the base unit that only yields noticeably in the center of the speaker's grille, the lid can be warped extremely using both hands (typical laptop issue). The very audible hinges are adjusted so that only one hand is needed for opening. As expected, vibrations cause the screen to rock slightly. The casing gives an overall good but not outstanding presentation. The 17-incher is located in the upper third since most all-rounders make a cheaper impression. The connectivity can compete with multimedia contenders. Three video outs (VGA, HDMI & mini-DisplayPort) are just as impressive as four USB ports (2x USB 2.0 & 2x USB 3.0). The left's back area sports a Kensington lock, a (foldable) RJ45 Gigabit LAN port and the power socket. The manufacturer makes cutbacks in audio jacks. A headphone/microphone combo jack is a bit stingy. Surround sound is only available via the digital video outs. The 4-in-1 card reader (SD, SDHC, SDXC, MMC) cannot really compensate for this shortcoming. 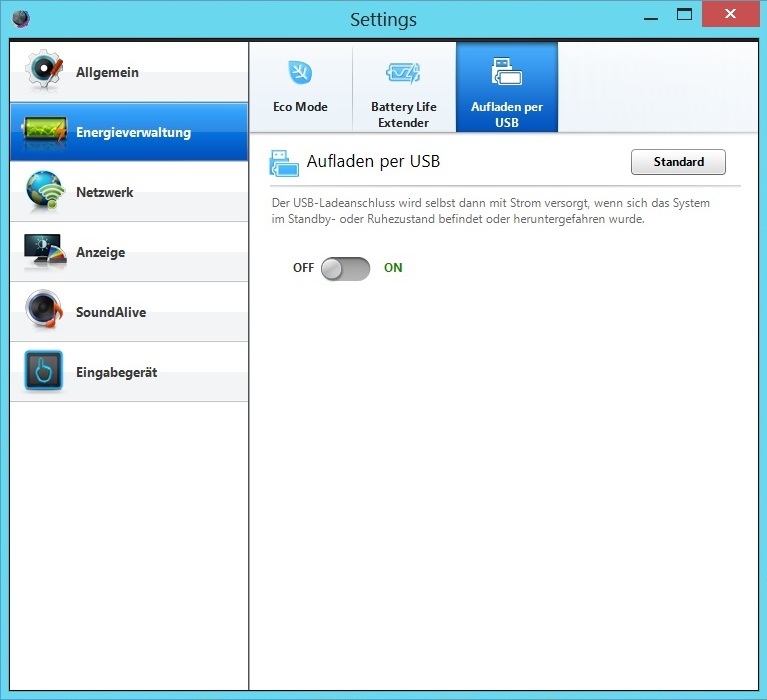 Although left-handed users will have to cope with restricted elbowroom when many cables are connected (keyword: external mouse), the interface positioning appealed to us. Users who do not own a headset with microphone for voice chats can use the built in microphone in the wrist rest's left area. An Intel product is used for wireless communication. The Centrino Advanced-N 6235 PCIe card supports both the 2.4 and 5.0 GHz frequency and transmits data with a maximum of 300 Mbit/s. Bluetooth 4.0 is also supported besides Wi-Fi 802.11 a/b/g/n. The Wireless Display technology, Smart Connect and vPro are also part of the specs. It is too bad that the wireless module's range was unsatisfactory in the test. At first glance, the maintenance options seem quite restricted. Only one DDR3 RAM slot is found underneath the small flap and is equipped with 4 GB in the 770Z7E-S01DE. The other 4 GB is unfortunately soldered to the motherboard. The casing's entire bottom has to be removed to access the 17-incher's innards (e.g. the hard drive). Although just a simple Phillips screwdriver is needed, almost 10 screws are anything but convenient. Also, the battery is not outside the casing but adversely under the hood. 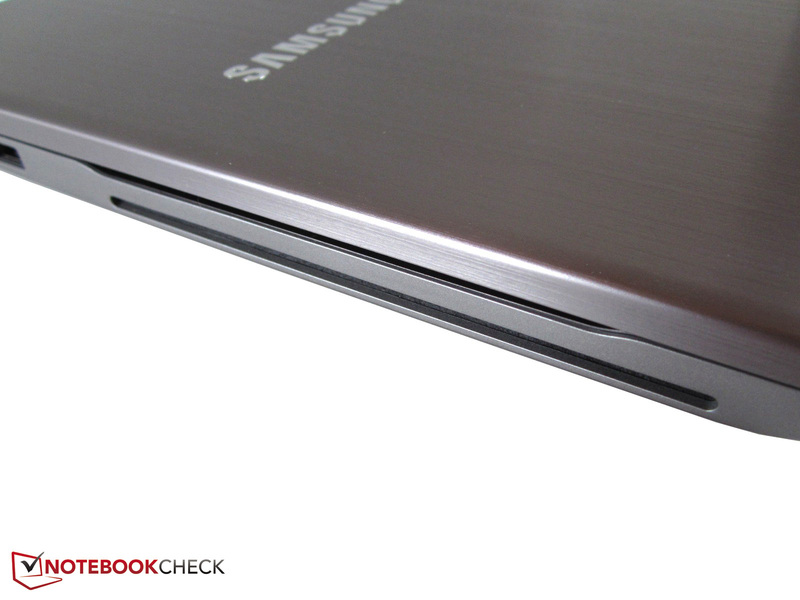 We find it a bit aggravating that the 17-incher follows the example of ultrabooks in this category. We would prefer a traditional maintenance cover that allows fast access to the fan, cooling system, hard drive and the (entire) working memory a lot more. Nearly 40 programs, drivers and tools are preinstalled in state of delivery. 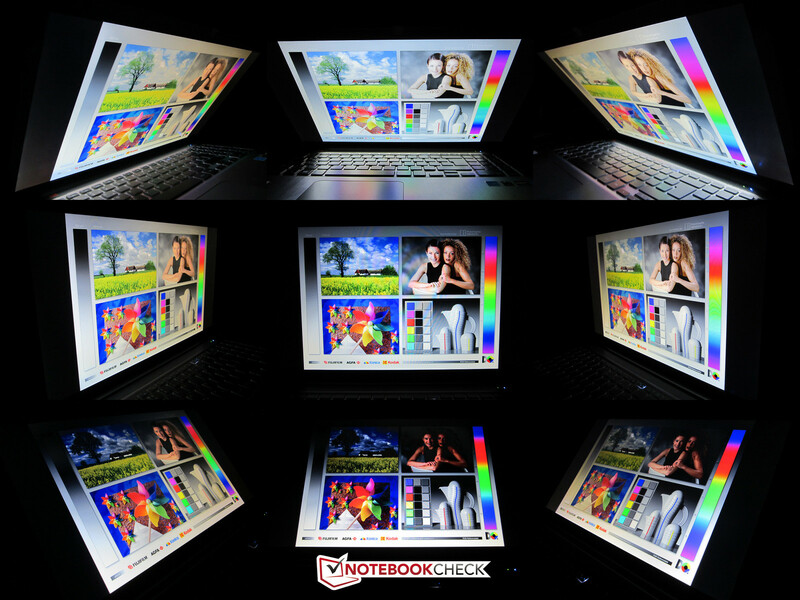 The manufacturer installs "Adobe Photoshop Elements 11", "Cyberlink PowerDVD 10" and "Windows Essentials 2012" among other programs on the hard drive. "Microsoft Office" and "Norton Internet Security" are time-limited trial versions. 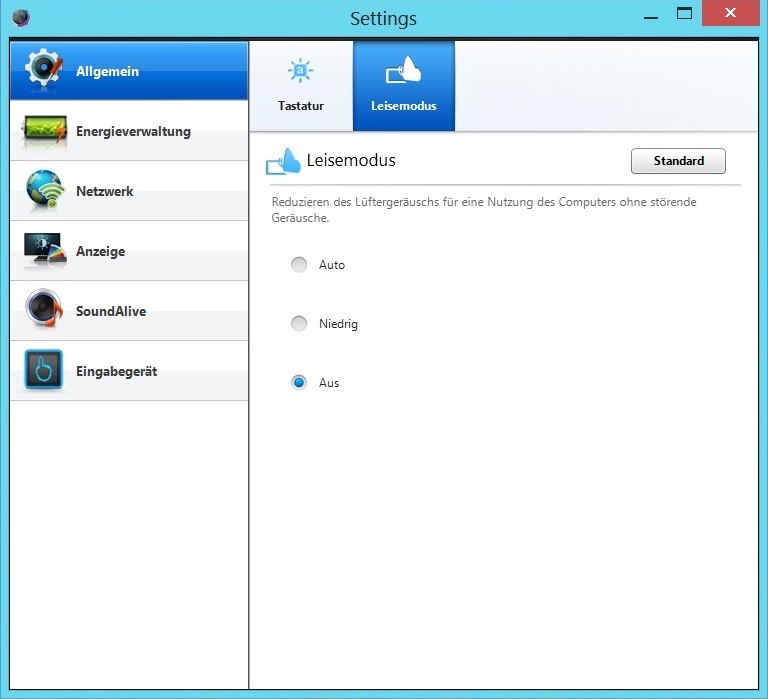 The program dubbed "Settings" is also worth mentioning. 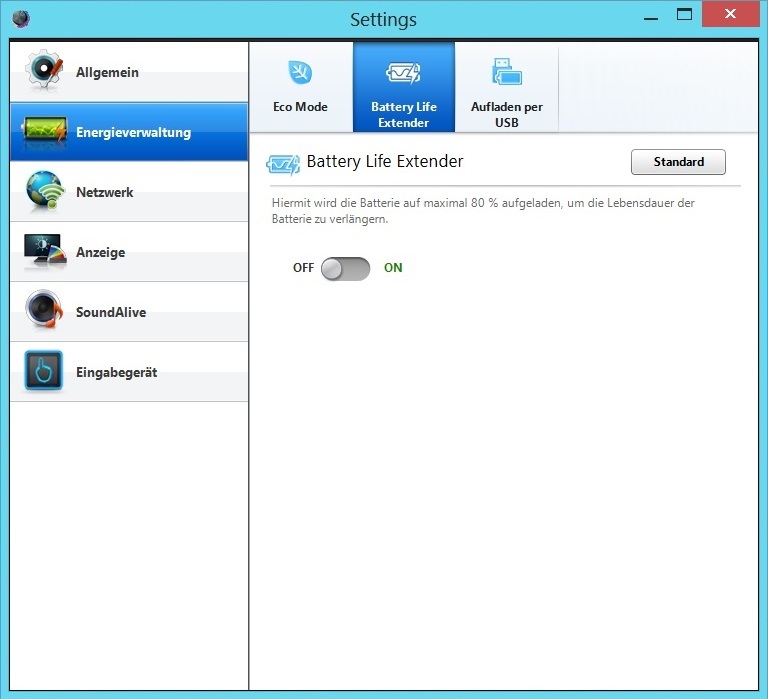 The user can for example change the deactivation speed of the keyboard's light (several levels) or customize "Silent Mode" under "General". 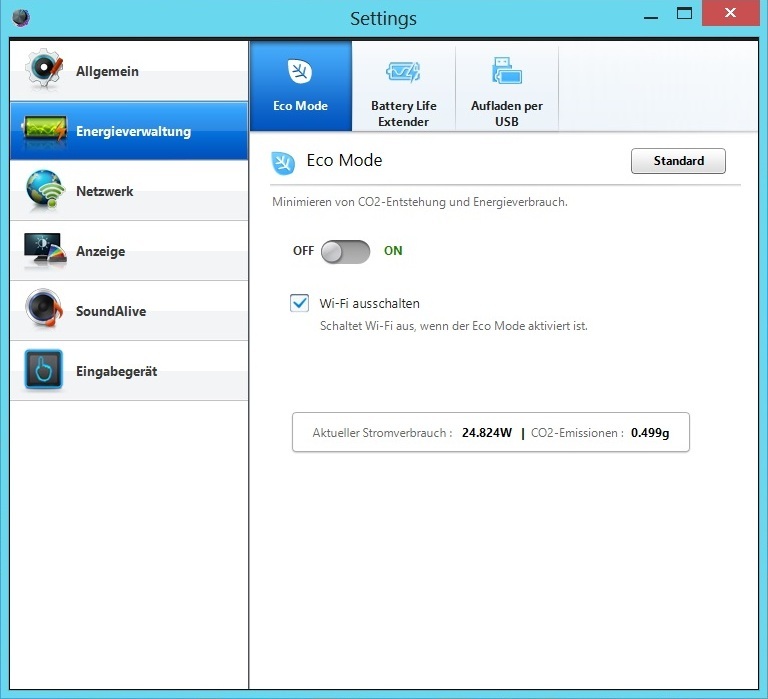 "Eco Mode" (reduces the power consumption), "Battery Life Extender" (the battery is only charged to 80%) and "USB Charger" can be enabled or disabled via the tab "Energy Management". The small 125 x 50 x 30 millimeter and 340 gram light 90 watt power supply is only accompanied by a few information leaflets, i.e. quick start guide, safety instructions, warranty information. 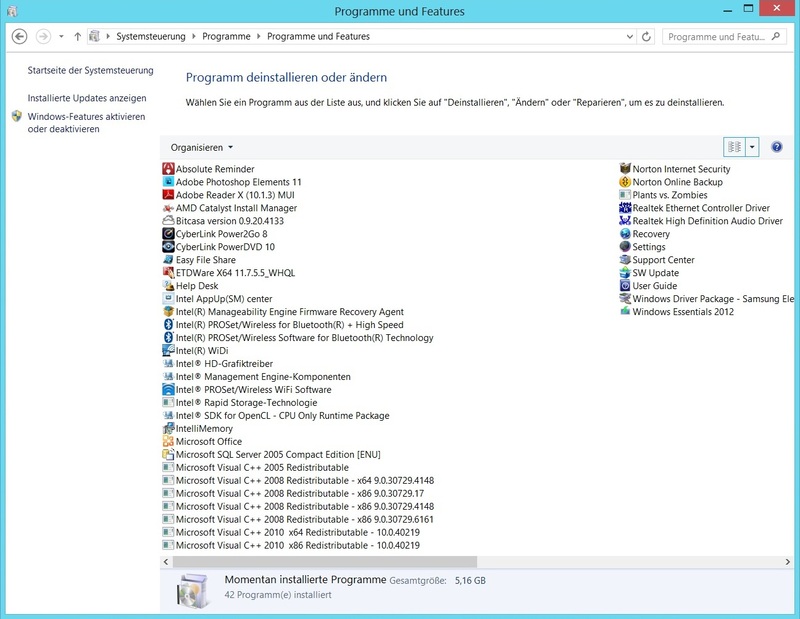 There is no recovery medium, but that can be created using the program with the same name. A driver DVD is also not included. The 24 month standard warranty can be upgraded to three or four years within 90 days. 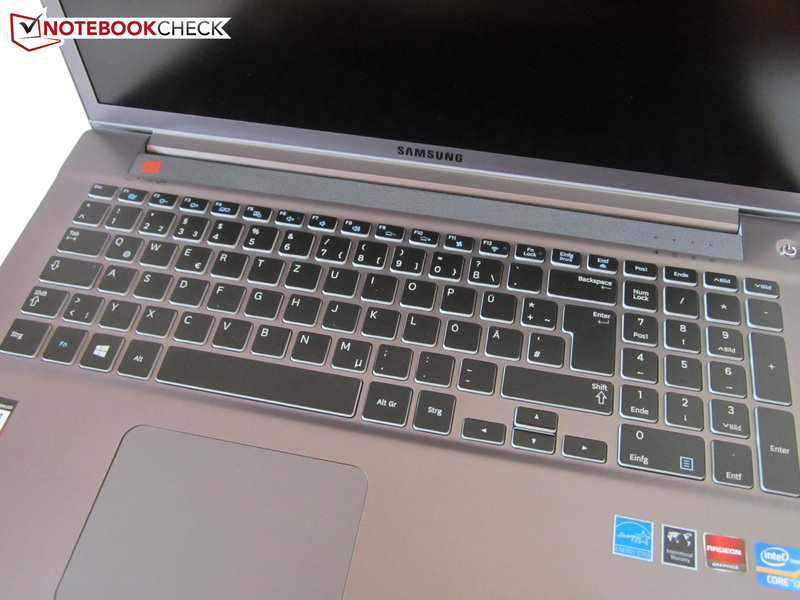 Samsung draws from all resources and installs a white backlit chiclet keyboard that is lowered a few millimeters. The keyboard will even satisfy prolific typists with its spacious wrist rest, pleasant typing feel owing to a good pressure point and stroke and decent noise. The key size of averagely 15 x 15 millimeters does not give reason for complaint either. Only the arrow keys and the F row could have used a bit more height. 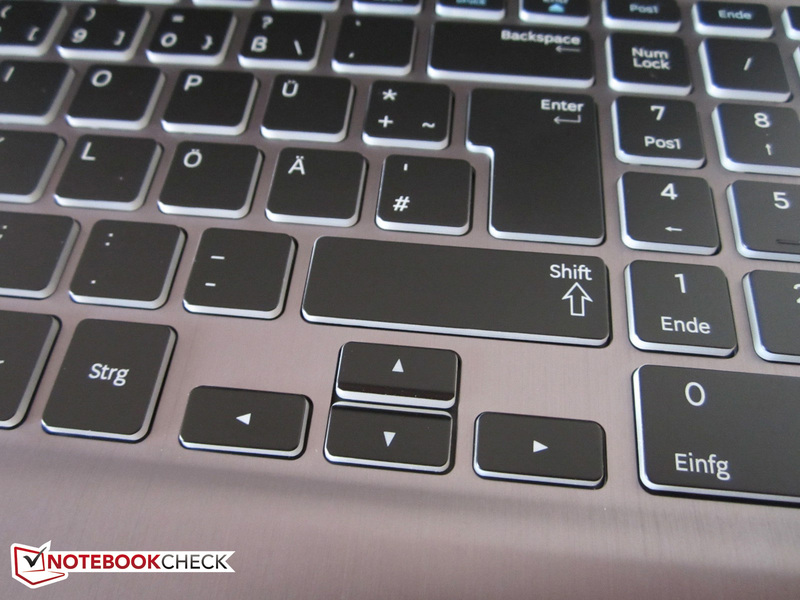 Laptop typical special functions that are enabled via the FN key as usual have been cleverly lined up. The user will not only find the brightness and volume controls but also the keyboard's backlight as well as buttons for the Silent Mode, touchpad, wireless module and slot-in drive here. The keyboard is completed by a four column number pad. 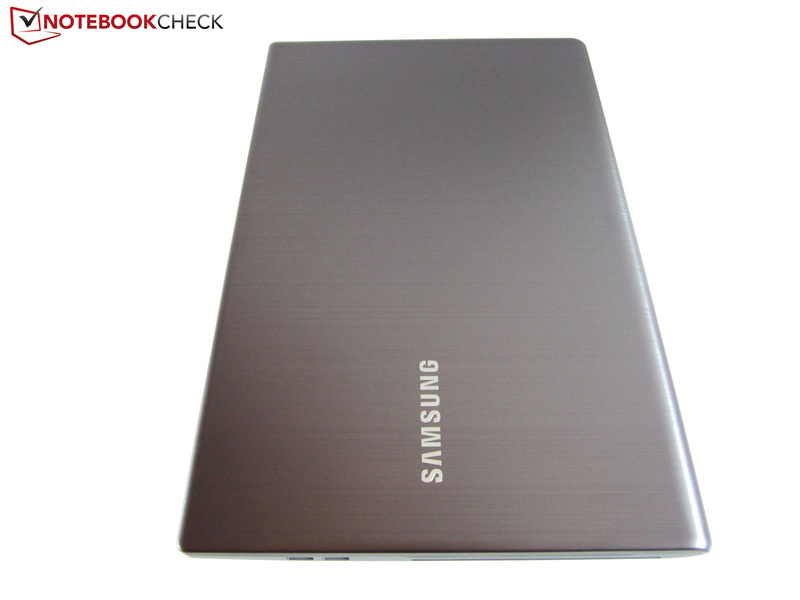 Since Samsung largely sticks to the standard, most users will quickly accustom to the layout. The generously sized Elan Smart-Pad of 107 x 77 millimeters supports two up to four finger gestures (scroll, zoom, rotate, etc.). The multi-touch technology was quite inconspicuous in practice and did not exhibit any major flaws. The various finger gestures are explained in a video via the touchpad software. The mouse replacement also scored quite well in the other tests. 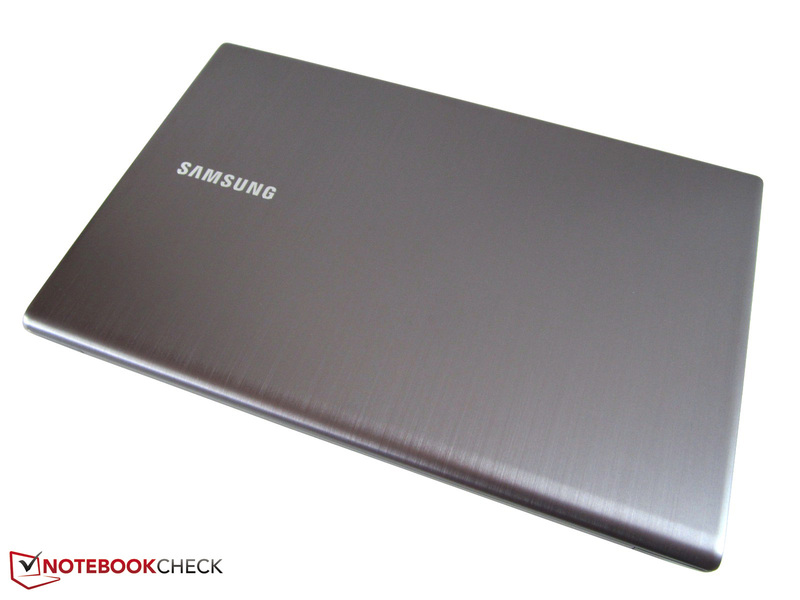 Samsung ensures for a first-rate gliding capability with the sleek surface. The accuracy is also decent, although the input could be a bit more precise here and there. 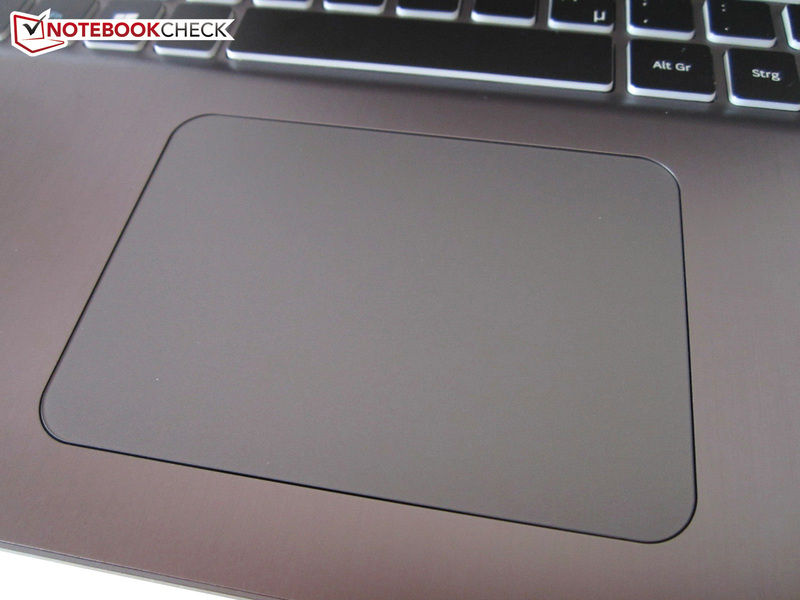 The keys embedded directly in the touchpad (no transition to the "normal" surface) are certainly a matter of taste. Nevertheless, the majority of buyers will cope after a short familiarization period. 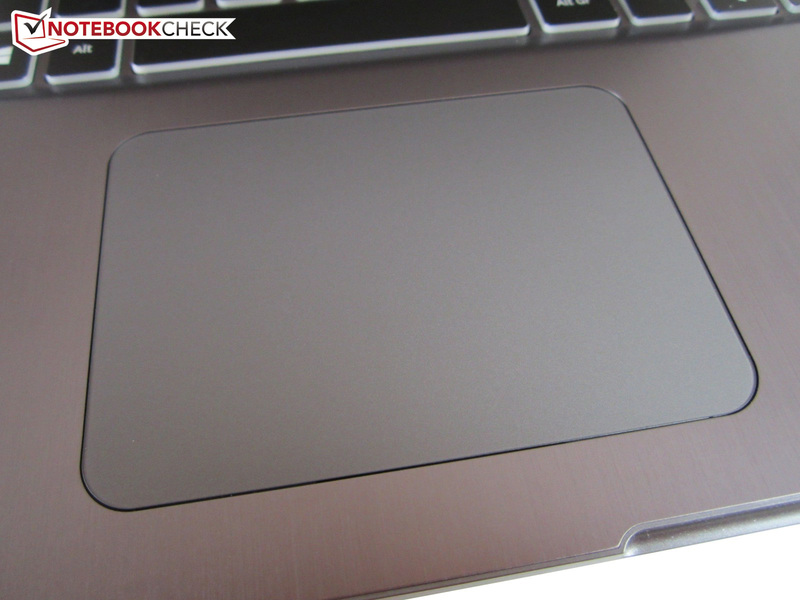 In contrast to Lenovo's IdeaPad Y500, which features a similar model, the touchpad barely yields. Samsung installs a matte, Full HD screen with a 16:9 aspect ratio to meet the high claim and justify the laptop's price. Although 1920x1080 pixels tend to push the graphics card to its limits in 3D programs, the manufacturer has opted for an appropriate resolution in our opinion. Games and movies can be enjoyed adequately alongside the screen's big diagonal of 17.3-inches / 43.9 centimeters. However, this verdict is not only based on the technical specs but also on real measurements. Unsurprisingly, the Chi Mei N173HGE-L11 screen, extremely popular among laptop manufacturers and which is also found in the Chronos 770Z7E, scores with a beautiful picture quality. 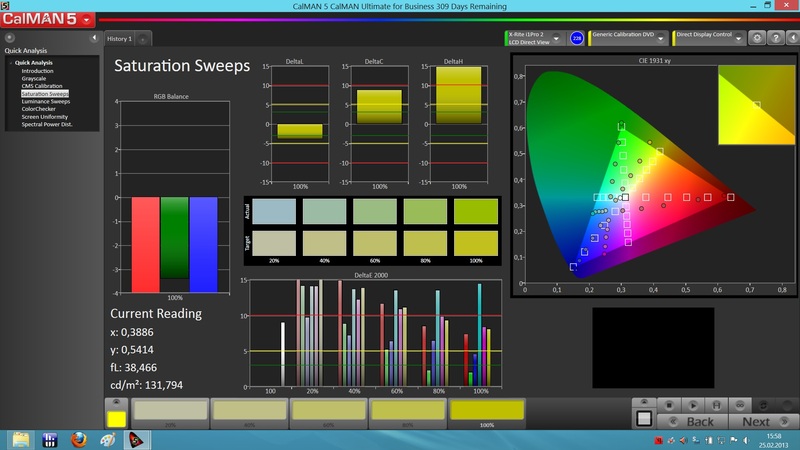 Apart from the odd color and calibration weakness (see CalMan screenshot), which is barely if at all noticed by the average user and the weak illumination of ~80%, the screen does a good to very good job. 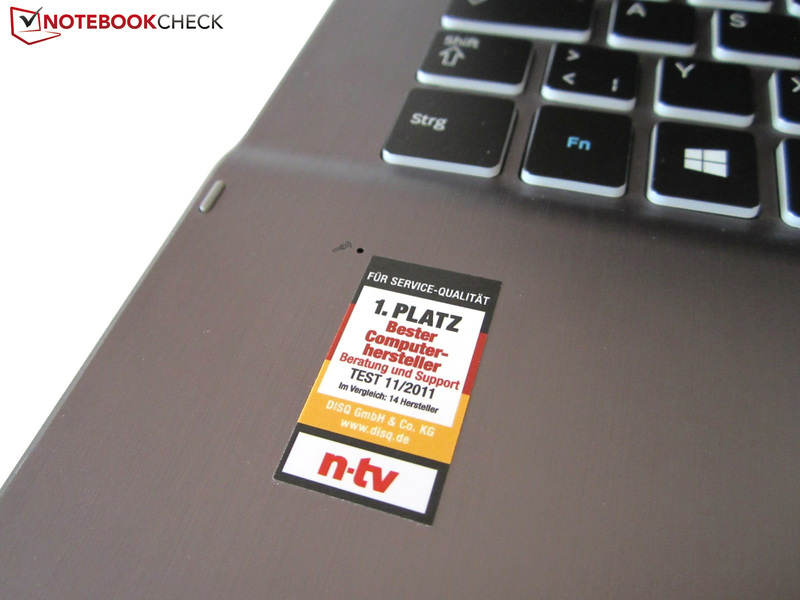 For example, the black value of 0.3 cd/m² is much better than that of a low-cost, mainstream screen, such as the recently reviewed Dell Inspiron 17R-5721. The advantage is that dark contents look more intense and not as grayish. A brightness of just below 250 cd/m² is also easily sufficient indoors. We would say that the biggest highlight is the high contrast of 900:1, which is unreachable for standard screens that are usually below 500:1. 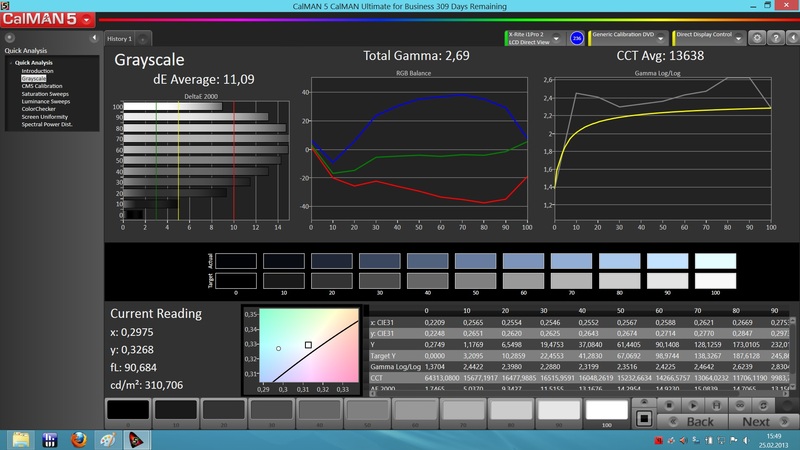 The interpolation capability also ranges above the average. Only the fact that the brightness is massively reduced on battery power annoyed us. 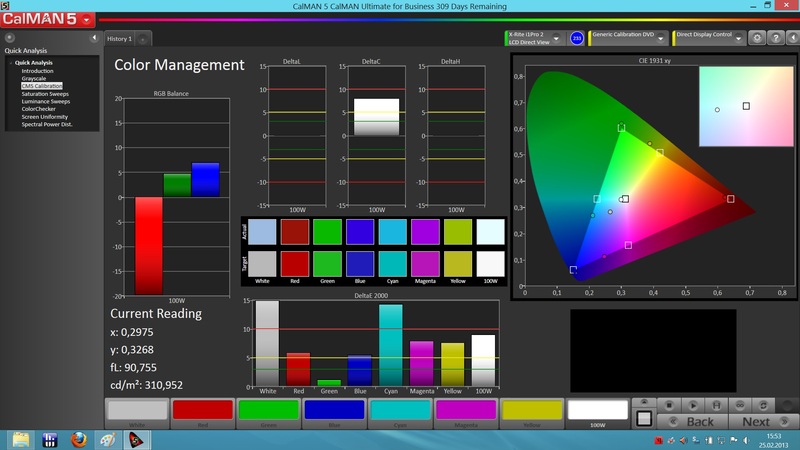 The brightness of our test device suddenly dropped from 272 cd/m² to just 208 cd/m² in the screen's center. That is roughly 25% less. 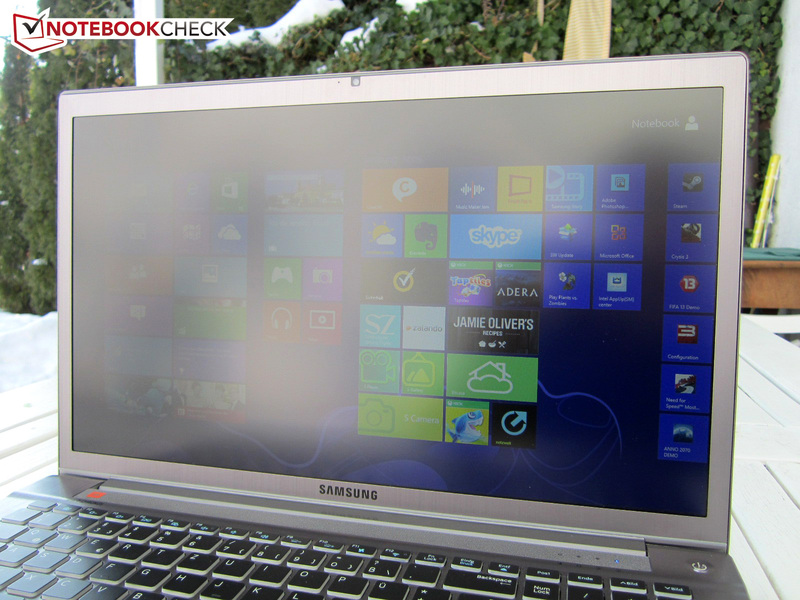 As our pictures show, the laptop is no longer unconditionally outdoor suitable. Its use is very restricted, particularly on bright days. Users who work outdoors should connect the device to the mains where possible. The viewing angles convinced us to the largest degree. The picture remained attractive both horizontally as well as from slanted angles, although the colors deviated slightly. The image stability is not quite as high vertically, but still decent when compared with other screens. It is not least due to the modern 22 nm manufacturing that Intel's Ivy Bridge generation has become a synonym for high performance and reasonable power consumption. 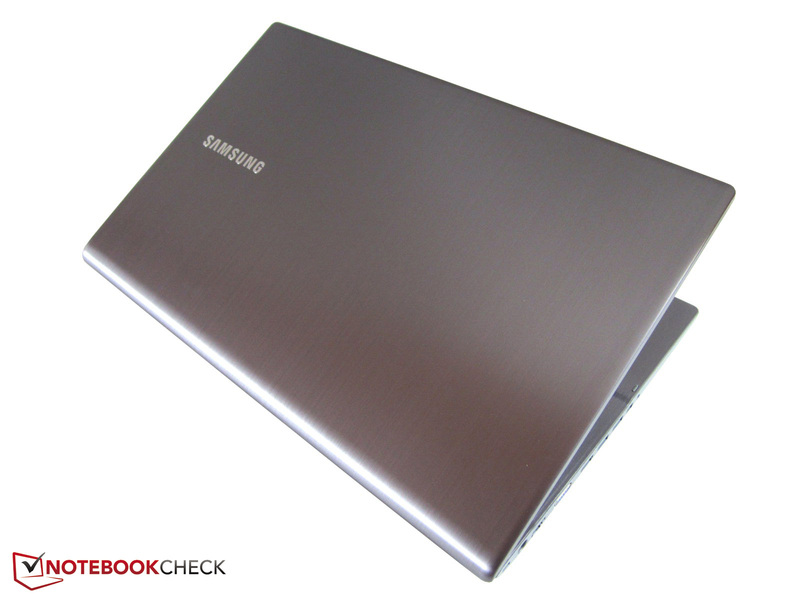 Samsung does not install a dual-core model but a potent quad-core despite the slim build. With 1.4 billion transistors, 6 MB of L3 cache and a clock of 2.4 - 3.4 GHz, the Core i7-3635QM corresponds to the more known Core i7-3630QM model. Differences are only found in the graphics chips clock and feature list. 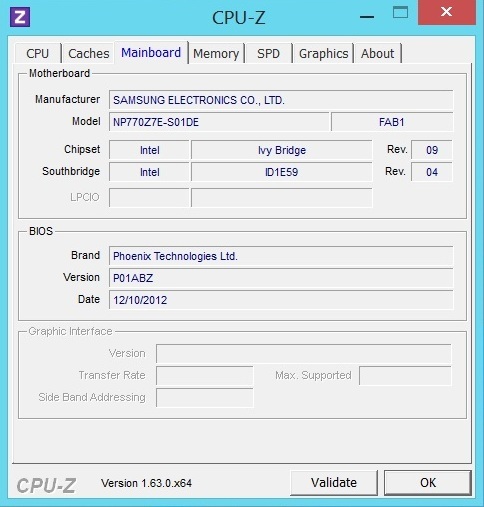 While the HD Graphics 4000 in the Core i7-3635QM runs with up to 1200 MHz, it is "only" 1150 MHz in the Core i7-3630QM. The latter model also does not support VT-d virtualization technology. The Chronos 700Z7C equipped with a GeForce GT 650M also featured the 2.3 - 3.3 GHz faster precursor Core i7-3615QM (also Ivy Bridge). The quad-core can process up to eight threads simultaneously via Hyper Threading, but does not bring any significant advantages in games. The automatic overclocking feature is dubbed Turbo Boost. The CPU clock does not reveal any nasty surprises when only the processor is loaded. 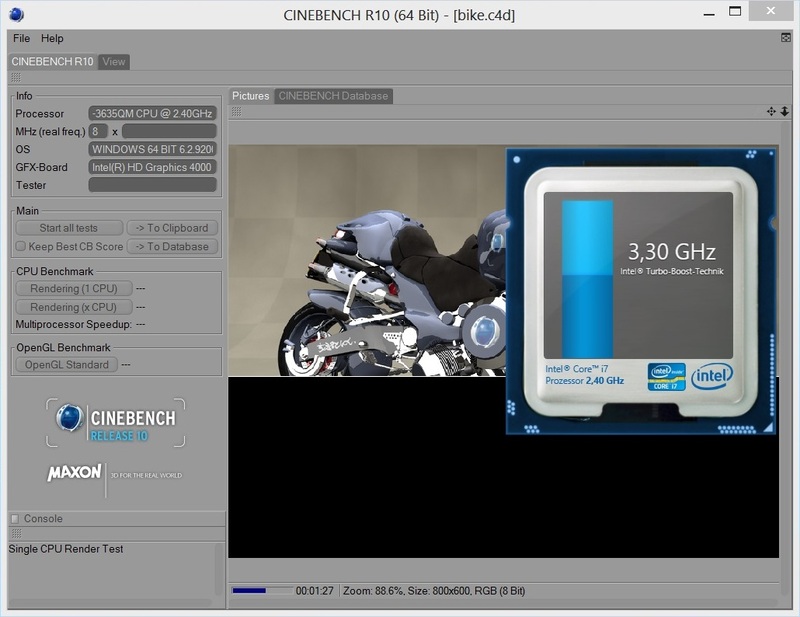 Approximately 3.3 GHz in single-core rendering and 3.2 GHz in multi-core rendering theoretically indicate a sufficiently sized cooling and power supply. The verdict is no longer as good as soon as the Radeon HD 8870M joins in. 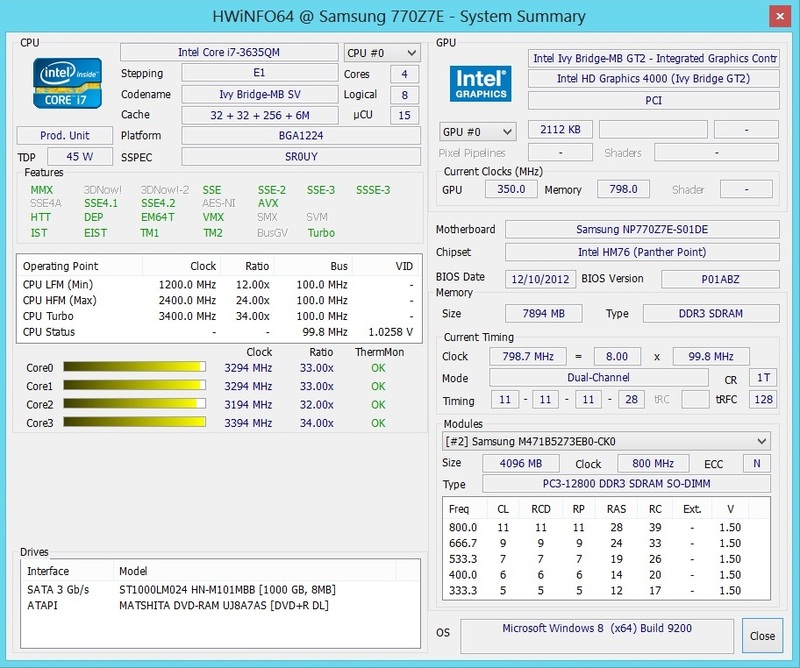 According to the HWiNFO tool, one up to three cores throttled to 1.2 GHz for fractions of a second. 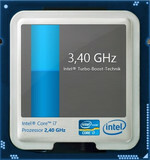 Although at least one core remained above the default rate and Intel's Turbo Boost Monitor displayed 2.4 - 3.1 GHz, the fluctuating clock partly affects the benchmark scores. CPU-heavy 3D programs, such as Hitman: Absolution, Guild Wars 2, Far Cry 3 or Assassin's Creed III, are particularly susceptible for this. This throttling can be related to the power supply (we measured just below 90 watts during full load), the CPU's temperature (according to HWMonitor a maximum of 95 °C in the stress test) or the manufacturer set this deliberately. A bug is apparently not responsible. 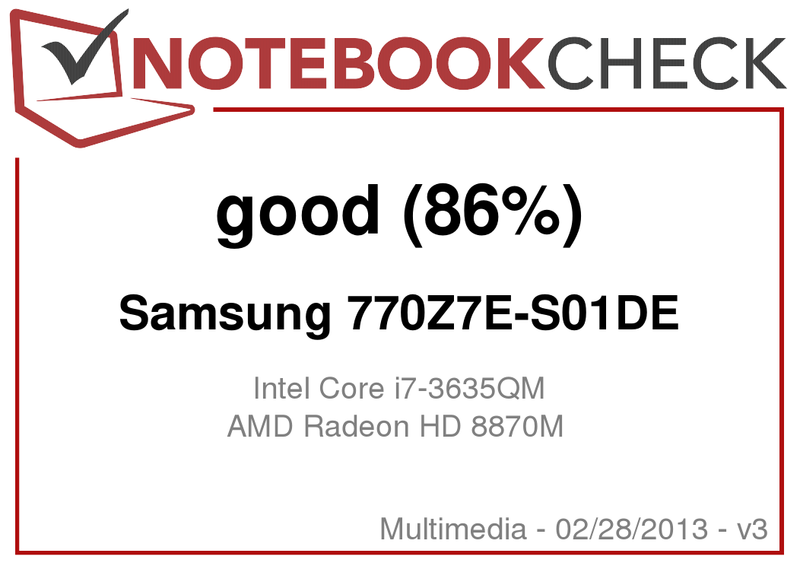 Perhaps Samsung would be well-advised to install a dual-core CPU or a quad-core with 35 rather than 45 watt TDP, such as the Core i7-3612QM. 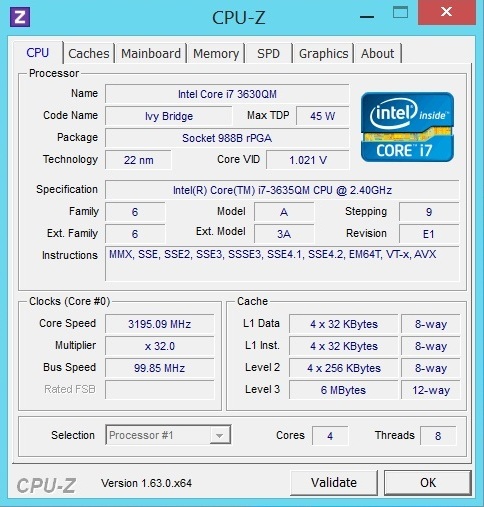 The Core i7-3635QM behaves properly in the CPU-only benchmarks. 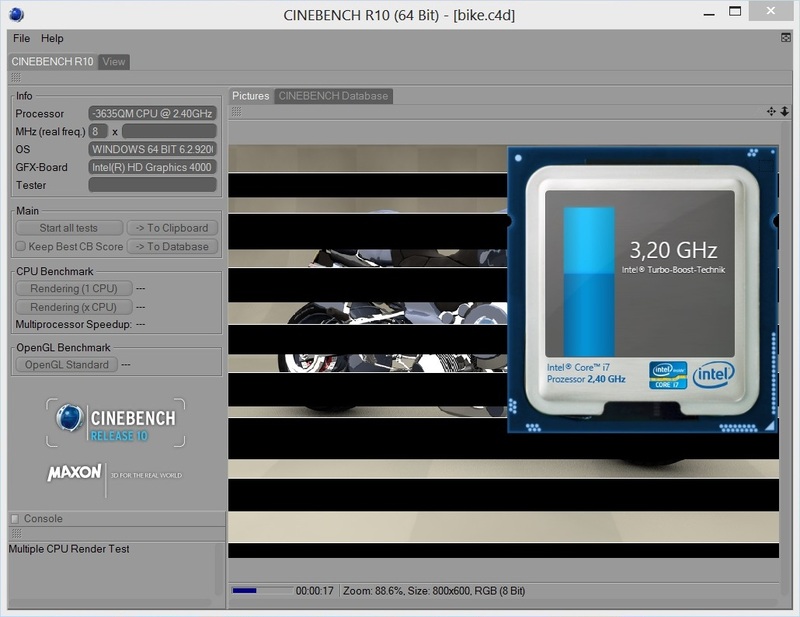 We used Cinebench R11.5 as an example. 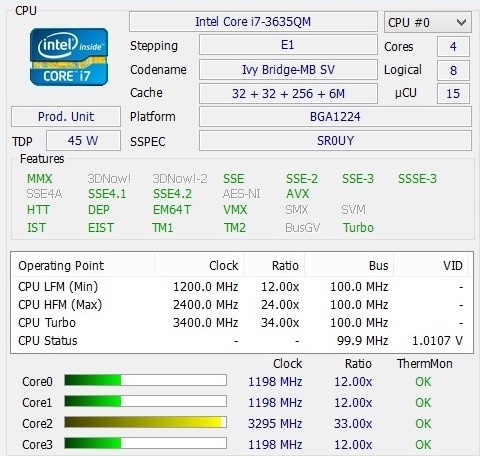 With 6.47 points in the multi-core test, the processor places itself almost exactly between the 100 MHz slower Core i7-3610QM (6.2 points @ Toshiba Satellite P855-107) and the 200 MHz higher clocked Core i7-3720QM (6.84 points @ Fujitsu Celsius H720). A similar picture is seen in the single-core test. 1.39 points are 2% higher than the score of the Core i7-3610QM (1.36 points) and 5% lower than the Core i7-3720QM (1.47 points). As mentioned in the intro, the Radeon HD 8870M chip is manufactured in a 28 nm process. Compared with the "old" Radeon HD 7870M, which is also based on the GCN architecture (Graphics Core Next), AMD increased the memory clock by 12.5% from 1000 to 1125 MHz (applies to the GDDR5 version). However, the core clock has decreased by almost 10%. 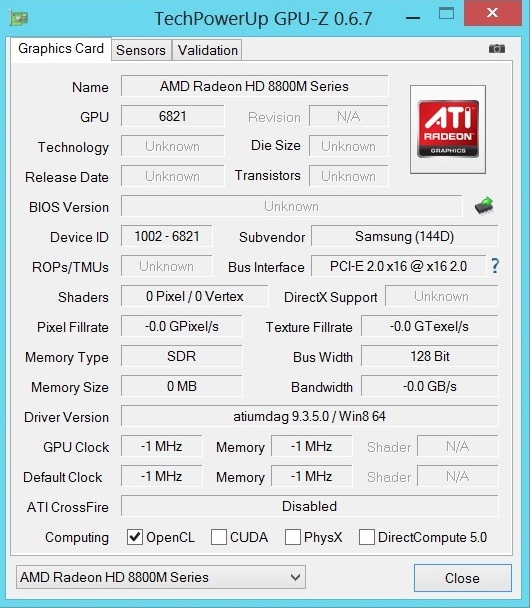 Rather than 800 MHz, it is only 725 MHz in the Radeon HD 8870M. Still, the 8000 range can make use of automatic overclocking. The core clocks with a maximum of 775 MHz in the Radeon HD 8870M, which adds up to a plus of 7%. 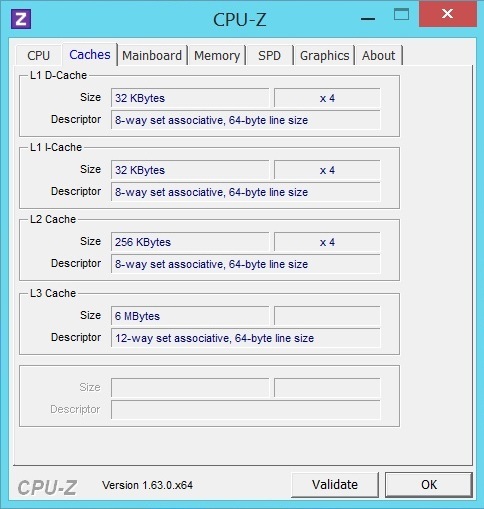 The Shader Unit count (640 Unified Shaders) and the memory bus (128 bit) are identical in both cases. It is great that Samsung does not make any compromises and uses a big 2048 MB GDDR5 video memory. The most important feature of the Radeon HD 8870M, next to DirectX 11.1 support, is its dynamic graphics switching dubbed Enduro. Programs are either assigned to the integrated or the dedicated graphics chip depending on their requirements. For example, while the web browser runs on the HD 4000, the Radeon HD 8870M accelerates games. Regrettably, Enduro still cannot hold a candle to Nvidia's Optimus counterpart despite various optimizations. On the one hand, Optimus provides more visual displays and convenience features and on the other, the detection rate is much better. It can recurrently happen that a 3D application is rendered unnaturally slow because the AMD graphics card is not enabled. 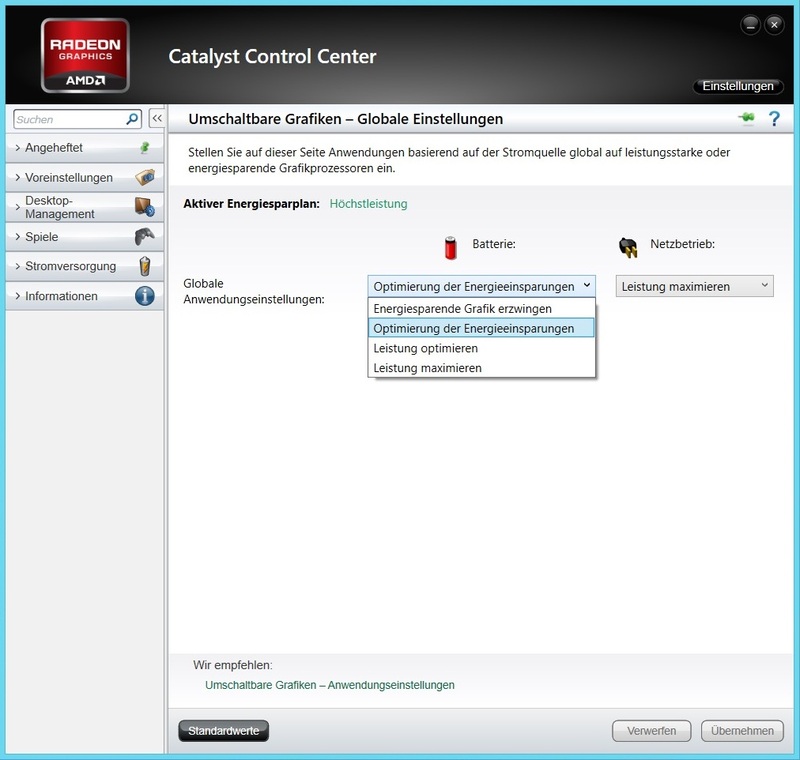 When this occurs, it is worthwhile to look in the Catalyst Control Center (see right screenshot). 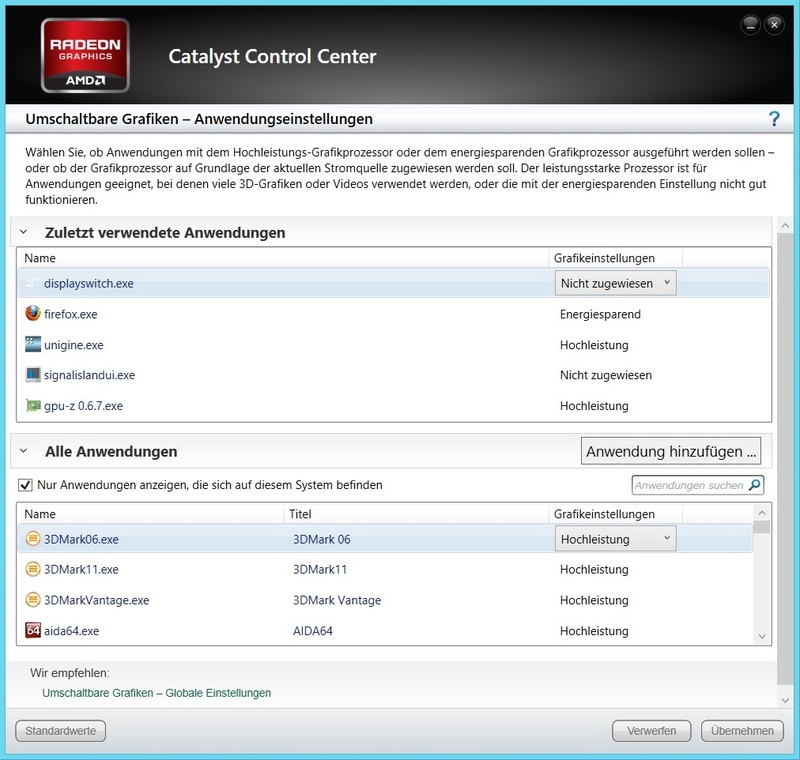 It is possible to manually assign single programs to either the integrated (energy-saving) or the dedicated (high-performance) GPU in the menu "Switchable Graphics Application Settings". Those who are lazy will simply adjust the global preset ("Maximize Performance" starts 3D programs reliably with the Radeon HD 8870M). In a nutshell: The DirectX 11 performance of the Radeon HD 8870M is baffling. With 2986 points in 3DMark 11, AMD's graphics card even places itself above the GeForce GTX 670M from Nvidia's old Fermi generation (2703 points @ Asus G75VW-T1040V). Both GeForce GTX 660M (2369 points @ Schenker XMG A722) and GeForce GT 650M (2113 points @ Medion Akoya P6815) Kepler models fall behind by almost 20 and 30% respectively. The differences are a bit lower in the Unigine Heaven 2.1 benchmark (1280x1024, high, default tessellation). 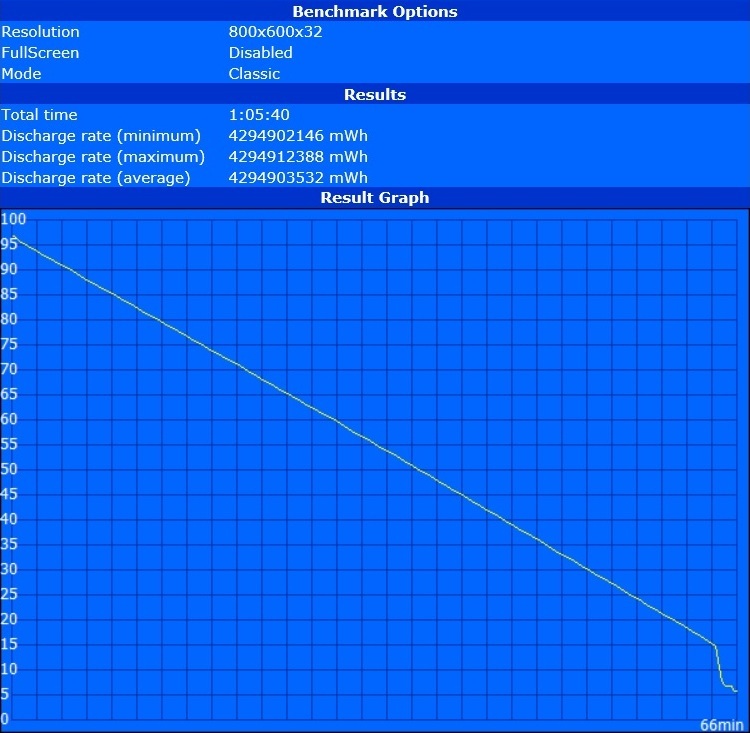 While the Radeon HD 8870M achieves an average of 37.6 fps, the GeForce GTX 660M reaps in a 14% lower 32.5 fps. The GeForce GT 650M lags behind by over 20% with 29.1 fps. 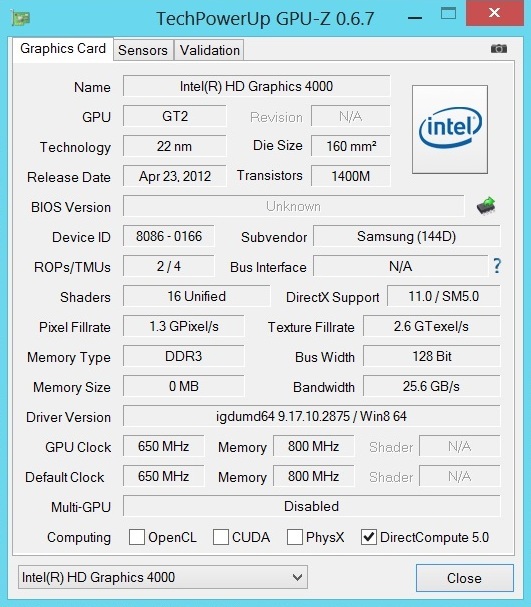 However, the Radeon HD 8870M cannot surpass the GeForce GTX 670M (39.0 fps). Generally true: The older and undemanding a benchmark is (DirectX 9, etc. 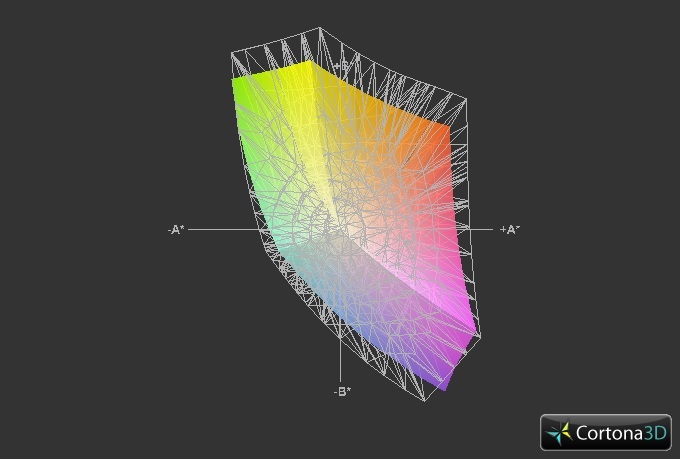 ), the better Nvidia's models look. Samsung naturally uses a hard drive from its own production line. 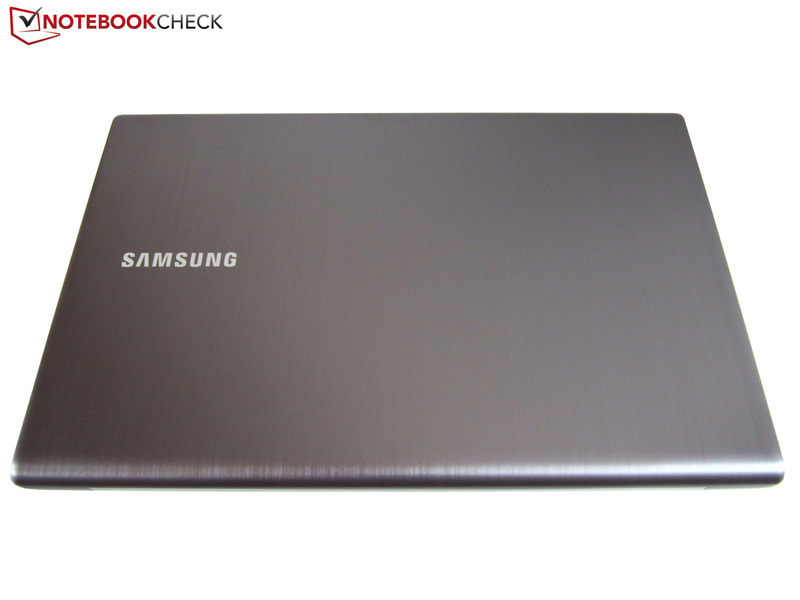 The 9.5 millimeter, slim SpinPoint M8 HN-M101MBB is a 1000 GB HDD that spins at 5400 rpm and offers 8 MB of cache. The benchmark results are more than decent for a 5400 rpm model. 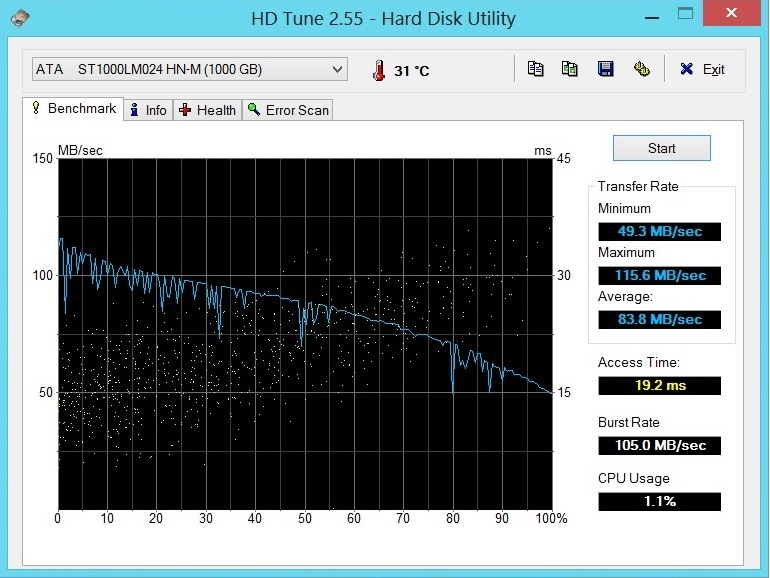 HDTune recorded an access time of 19.2 ms and a transfer rate of approx. 84 MB/s for the hard drive. CrystalDiskMark stated 93 MB/s in sequential read and 88 MB/s in sequential write. 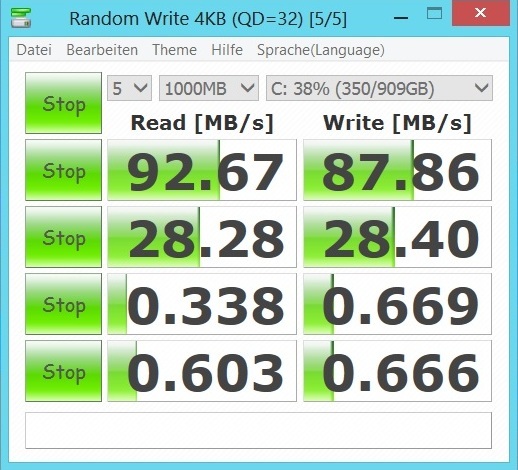 The likewise 1000 GB and 5400 rpm Toshiba MQ01ABD100 managed somewhat higher rates (just over 100 MB/s in Nexoc M507II). Users who do a lot of multitasking and despise unnecessary loading times should preferably choose a version with an SSD or install one. 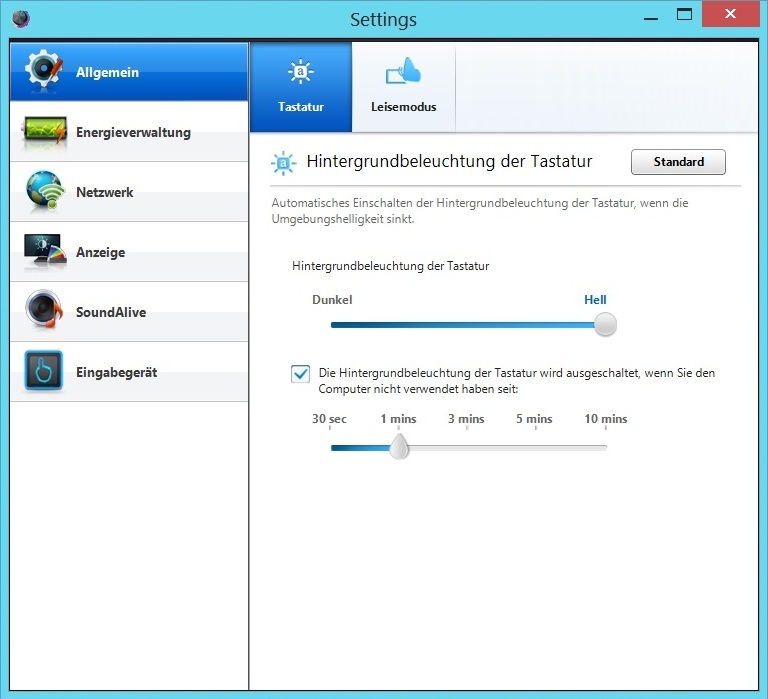 Solid state drives extremely speed up Windows routines. 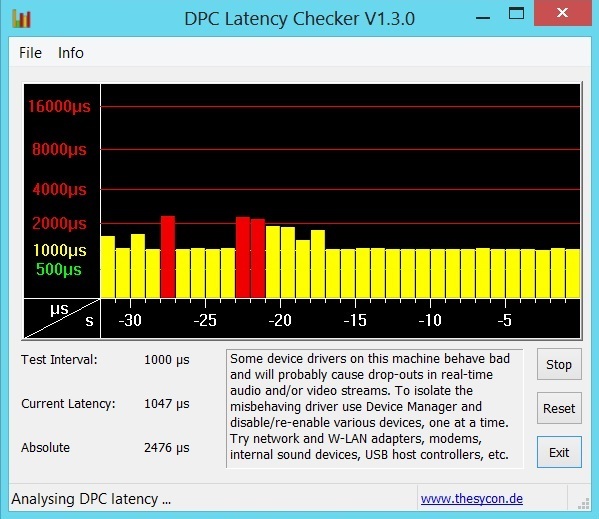 We ascertained the system performance with PCMark 7. The scores strangely deviated noticeably with every run. The total score settled to about 2900 points in two of five tests. Two other measurements settled to almost 3800 points. PCMark even once recorded 4400 points. We ultimately entered the average rate in the database. 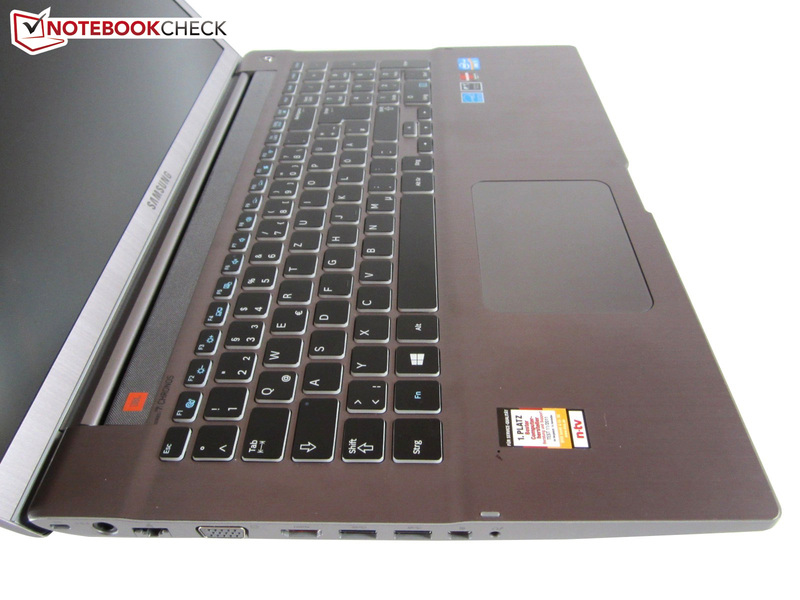 With 3750 points, the Chronos 7707E is exactly on a par with Schenker's XMG A502 (Core i7-3610QM, GeForce GT 650M & 120 GB SSD) and Toshiba's Qosmio X870-119 (Core i7-3610QM, GeForce GTX 670M, 128 GB SSD). 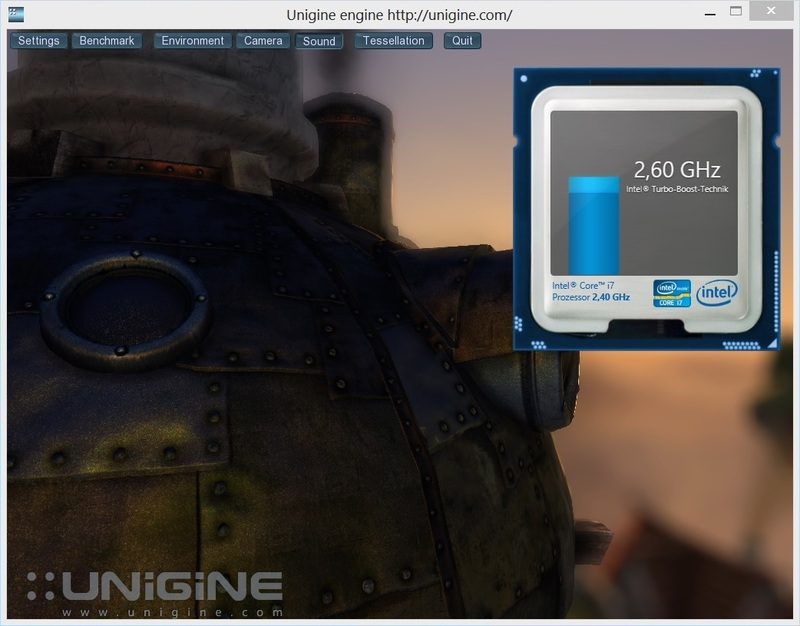 As can be seen in the benchmark below the review, the gaming performance varies extremely. 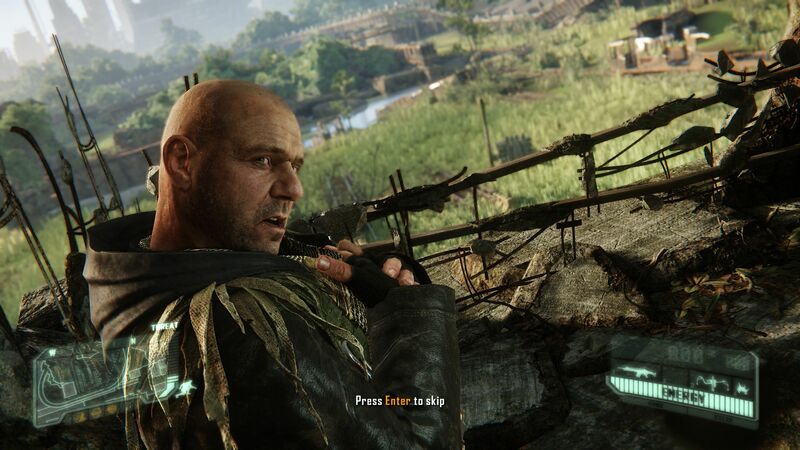 While the Radeon HD 8870M often places itself above the GeForce GTX 660M in DirectX 10 and DirectX 11 titles, such as Alan Wake, Max Payne 3, Sleeping Dogs, Anno 2070 or Battlefield 3 (at least in maximum settings), AMD's model is even defeated by the GeForce GT 650M in other cases. The graphics card seems to (still) have problems particularly with Unreal Engine 3 (Borderlands 2 & Dishonored). The moderate results in a few games or settings are not only to be explained with CPU throttling, but also AMD's driver. Enduro laptops are known to speed up less than technically equal Optimus contenders when the graphics options are reduced. Artifacts in Assassin's Creed III (white lines and surfaces) also prove that the preinstalled driver was not up-to-date. When compared with the Chronos 7707E, the Radeon HD 8870M settles in right behind the GeForce GTX 660M. 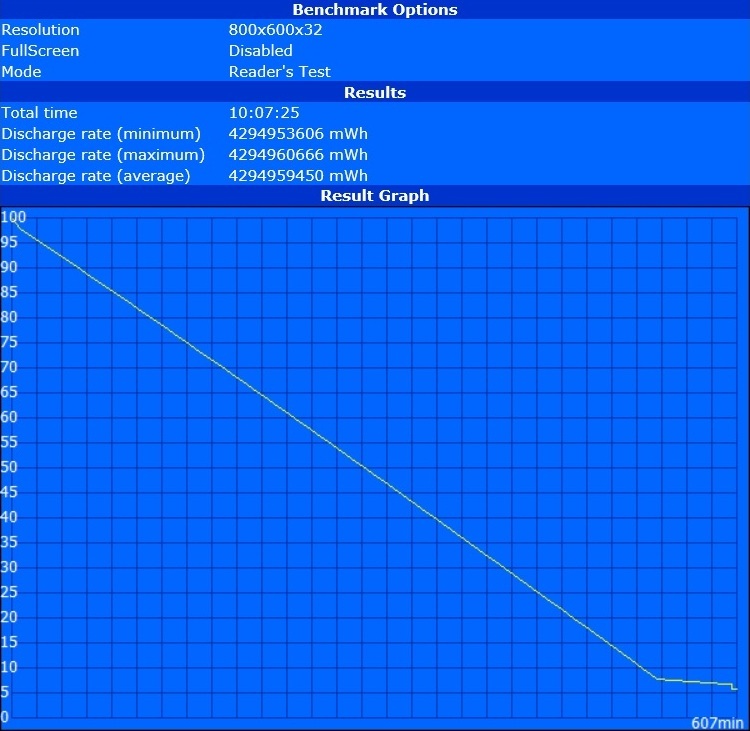 The GeForce GT 650M was 10% slower and the GeForce GTX 670M was over 20% faster after our benchmarks. The Radeon HD 8870M should overtake the GeForce GTX 660M with the latest driver and a CPU that does not throttle. Regrettably, the 28 nm GPU cannot quite fulfill the high expectations that the scores in the synthetic benchmarks aroused. Casual gamers who are satisfied with medium details, reduced resolution and/or disabled anti-aliasing when need be will have enough power though. Some games can even be played in the native resolution using very high details and anti-aliasing as a look at Dead Space 3, Call of Duty: Black Ops 2, FIFA 13, Counter Strike: Global Offensive, Diablo III and Mass Effect 3 show. The idle noise level comes very close to that of the Chronos 700Z7C. With an average of 31-32 dB, the 17-incher is only slightly audible, so agreeably quiet. Although the tested version never worked completely silently, the noise development is compelling. The noise increased to a maximum of 40 dB in 3D mode, which is still absolutely tolerable. Almost 35 dB in DVD playback will unlikely annoy anyone either (all measurements were made at a distance of 15 centimeters). 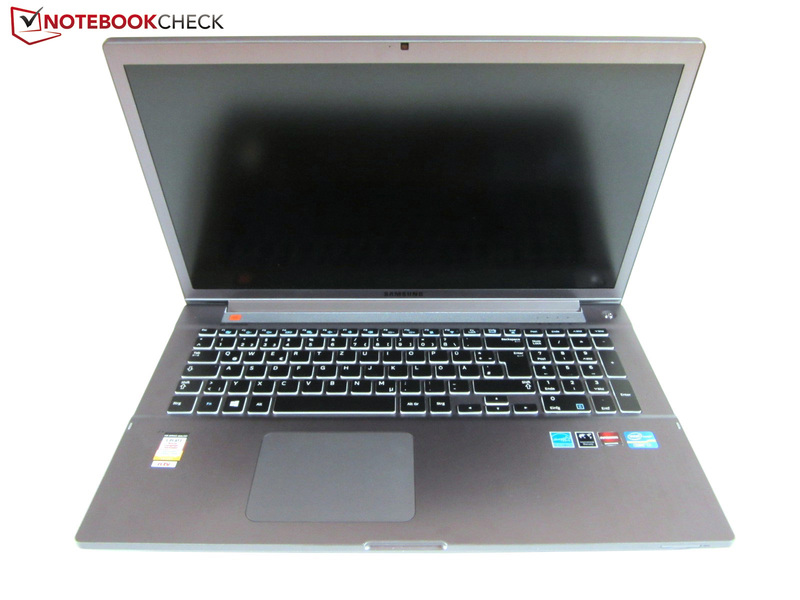 Even potent laptops, such as the Lenovo IdeaPad Y580, One K73-2O or Schenker XMG A522, are frequently much louder. We cannot make a general statement about the temperatures. While the casing just reached 27 °C in idle use, it heated up clearly during load. Our thermometer measured up to 50 °C on the top and up to 44 °C after one hour of our stress test using the tools Furmark and Prime. That might sound like a lot but it is not that bad in practice. For one thing, the system will never be loaded to such an extent in routine use. For another, the wrist rest never surpasses 30 °C. The Chronos 700Z7C achieved identical rates in 3D use with an average of 39 °C on the top and 35°C on the bottom. The components get a lot warmer. A maximum of 95 °C on the CPU and 87 °C on the GPU is relatively hot. 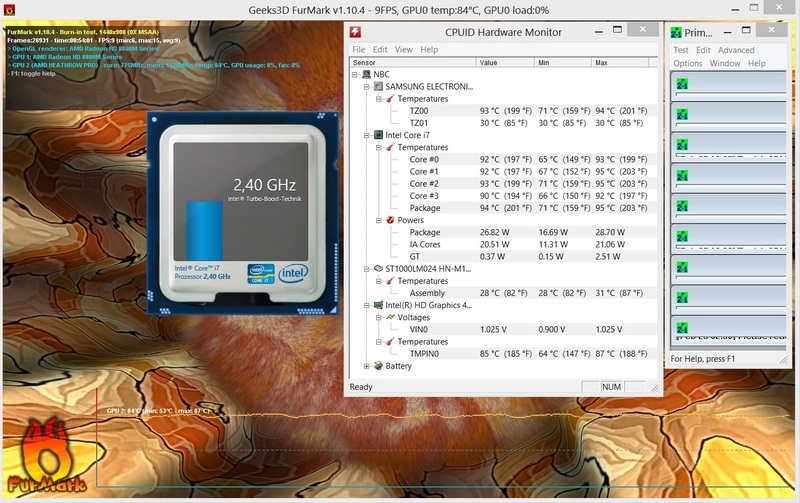 The processor would perhaps exceed 100 °C without temporary throttling, if the CPUID Hardware Monitors recorded correctly. (-) The maximum temperature on the upper side is 50.3 °C / 123 F, compared to the average of 36.5 °C / 98 F, ranging from 21.1 to 71 °C for the class Multimedia. 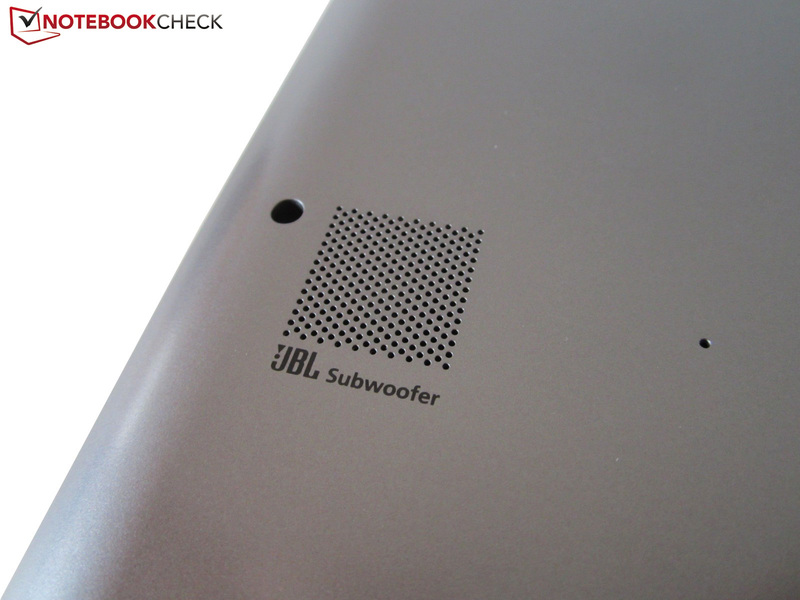 The 2.1 system from JBL surprises with a quite decent sound quality. Considering the laptop's low height, both speakers produce a more than acceptable sound. Owing to the installed subwoofer, even prominent though not outstanding bass is audible. The 2.1 system is quite suitable for permanent use alongside the high maximum volume. Thus, an external sound system is not imperative. However, the sound would have to be a bit more accurate and clearer to apply as a reference. 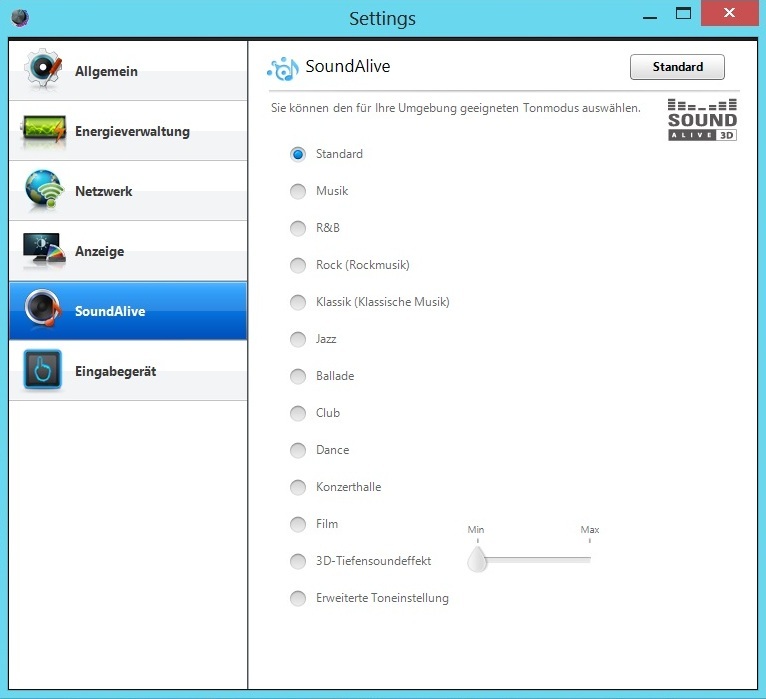 The "Settings" software contains several sound modes under the "SoundAlive" tab (e.g. music or movie). 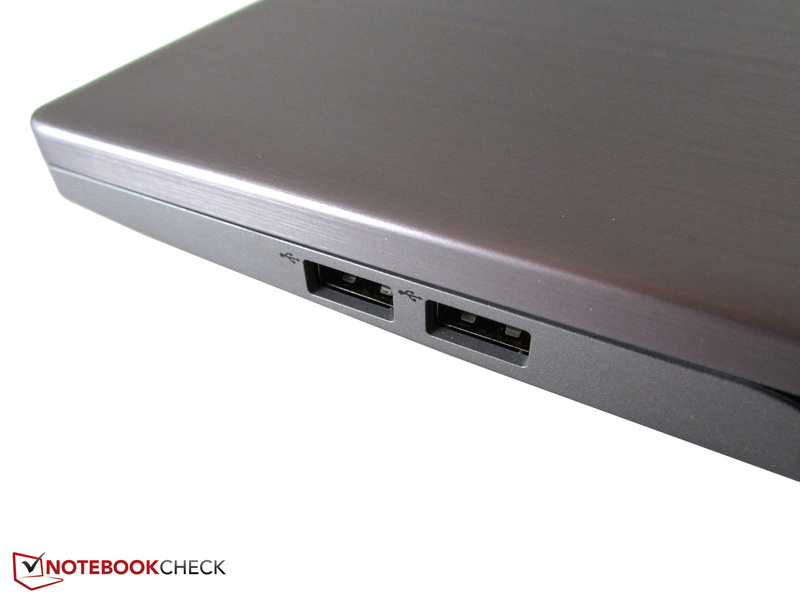 The energy-efficient hardware ensures moderate power consumption. 14 - 26 watts in idle mode does not give reason for complaint. 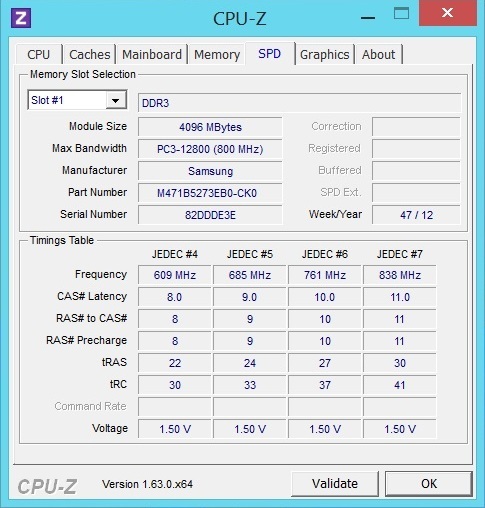 However, the Chronos 700Z7C (Core i7-3615QM & GeForce GT 650) is a bit more efficient with 12 - 21 watts. A load consumption of 76 - 92 watts is also reasonable. Despite its weaker components, the 700Z7C consumes roughly the same amount of power with 74 - 95 watts. Laptops featuring Nvidia's GeForce GTX 660M devour between 5% (Schenker XMG A722) and 40% (Gigabyte P2542G) more power depending on the device. The battery runtime is impressive. When the screen brightness was set to minimum and the system was barely loaded, the strong 80 Wh lithium polymer battery lasted for around 10 hours, which is a top rate. Five hours of wireless internet browsing with a slightly reduced brightness is also impressive. DVD playback using maximum brightness was possible for approximately 2.75 hours. The all-rounder was only not as compelling in Battery Eater's Classic test. Like most contenders, the laptop was drained after one hour. The verdict for the Chronos 770Z7E is mostly positive. The biggest unique selling point is definitely the slim build alongside powerful hardware. A quad-core CPU and gaming-suitable graphics card in a 27 millimeter device? Almost unthinkable a few years ago. 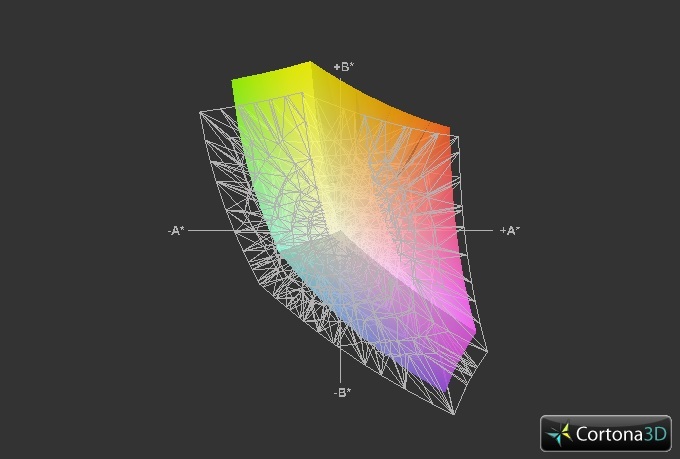 Those who expected an excessive temperature and noise development can be assured that the laptop does not get unpleasantly warm or loud even in 3D mode. Regrettably, Samsung achieves this successful concept with a processor that throttles. One up to three cores dropped to 1.2 GHz for a short period depending on the 3D application. Fortunately, this was hardly if at all noticed during most benchmarks. Since the 17-incher has many strengths, this flaw should not keep the potential buyer from purchasing. 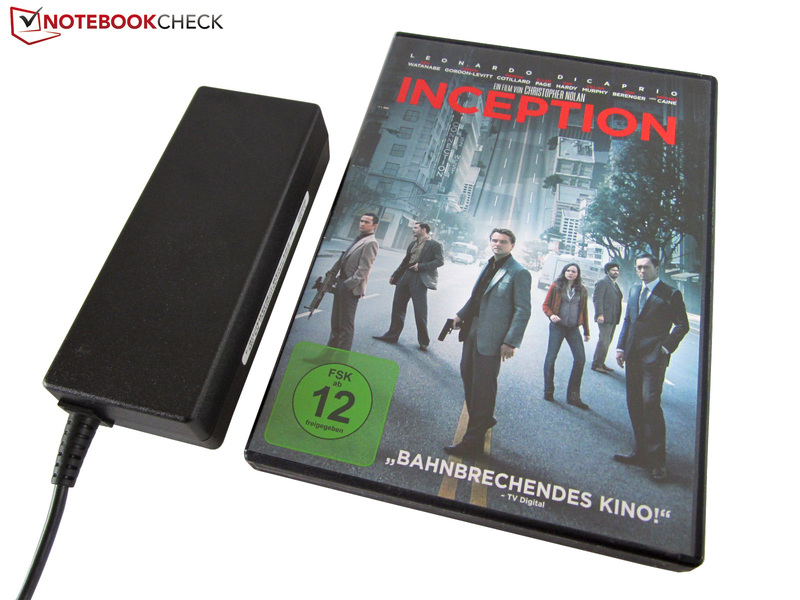 Besides the high-contrast Full HD screen, we liked the input devices, battery runtime and the looks. Such a good speaker sound is also not encountered every day. The 17-incher would be close to perfect with more convenient maintenance options, a better build quality and flawless CPU clocking. The all-rounder just misses a very good rating in its current form. 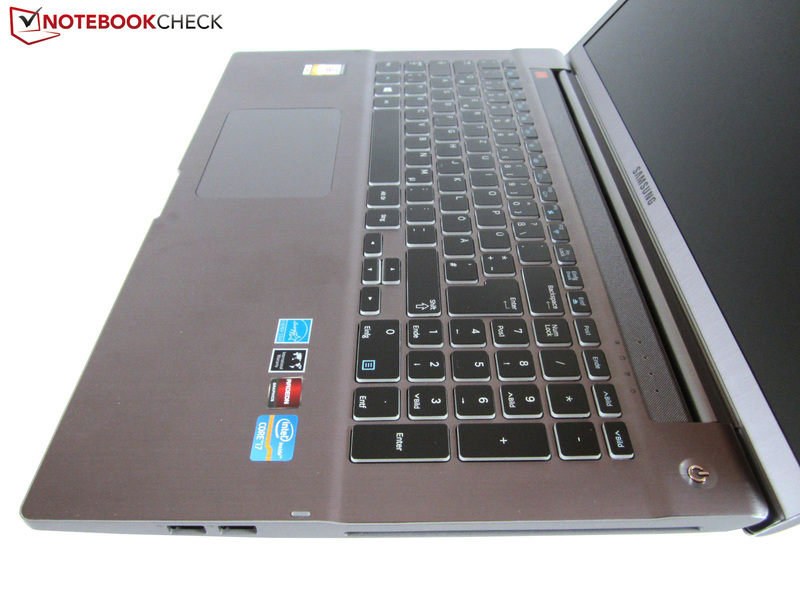 Nevertheless, equals among the multimedia laptops can be counted on one hand (Asus UX51VZ, Asus N76VZ & Apple MacBook Pro). 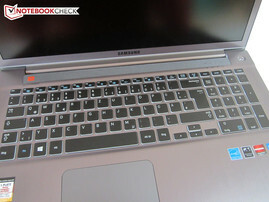 Samsung has done a great job with the Chronos 770Z7E. 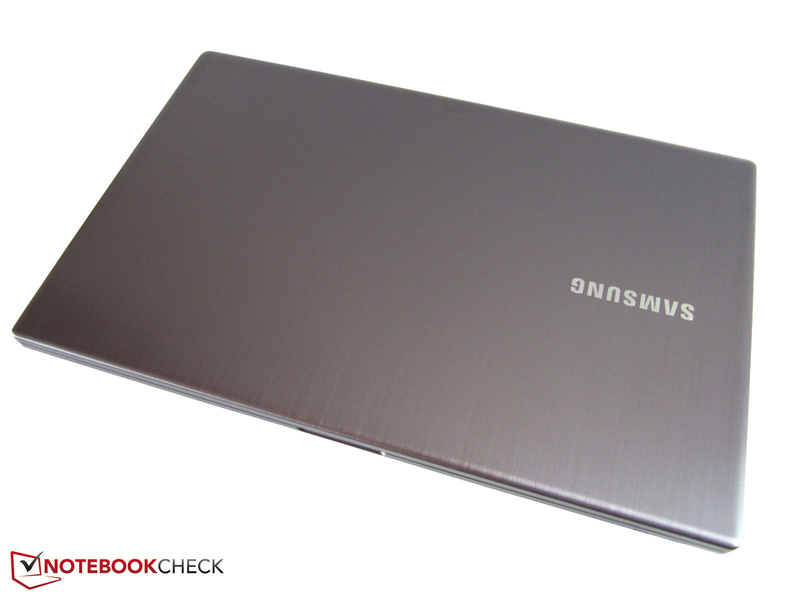 Samsung relies on a silver-gray color. The status LEDs are located beside the power button. The white keyboard light can be adapted using F9 and F10. The arrow keys could be bigger. While the GPU belongs to the upper midrange, the CPU comes from the premium range. 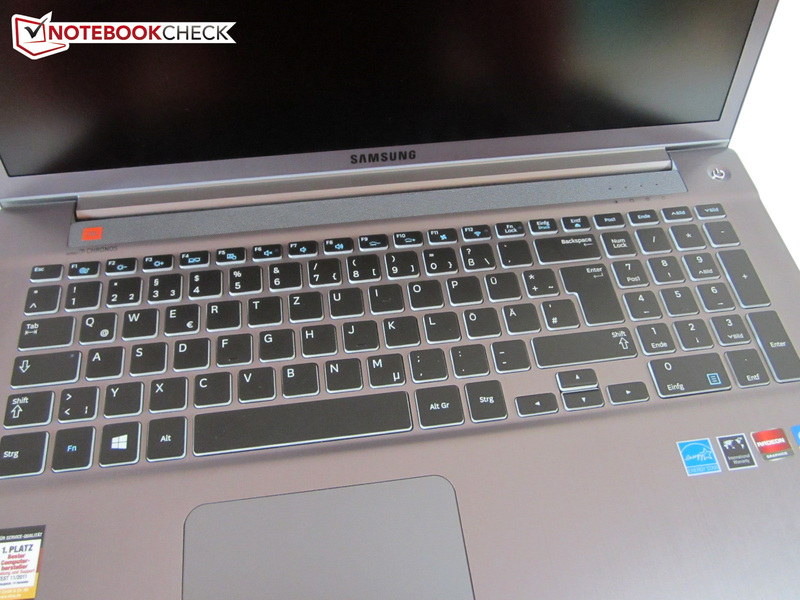 The touchpad supports various gestures. A microphone is built into the wrist rest. The right provides two USB 2.0 ports. 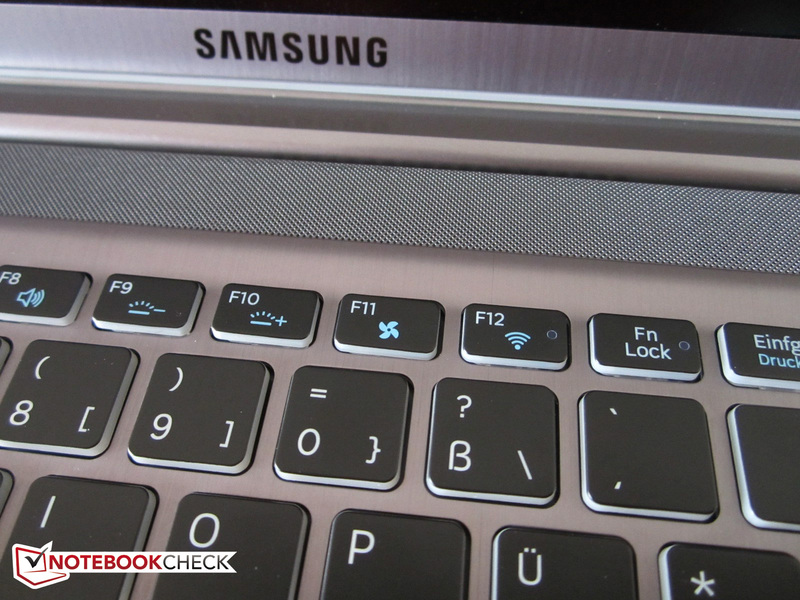 Samsung opted for a slot-in drive. The RJ45 Gigabit LAN port has to be folded out before use. 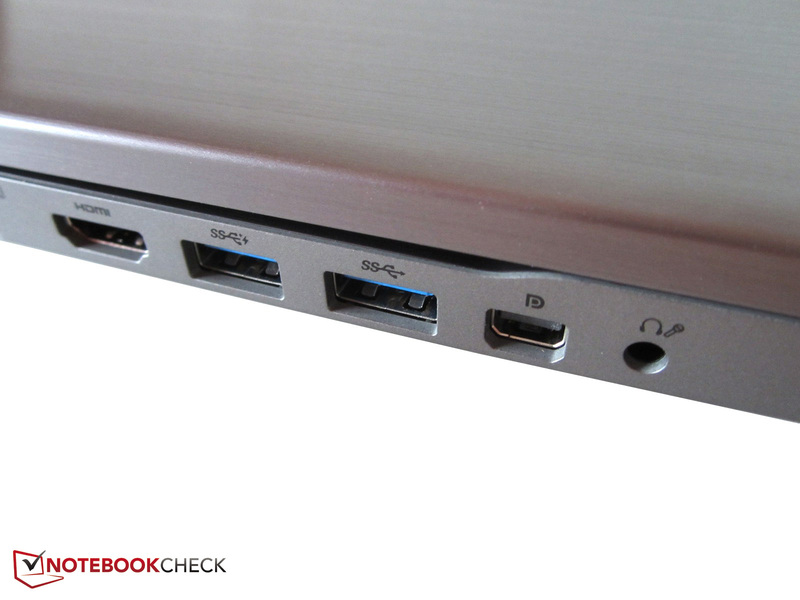 The digital video outs (HDMI & mini DisplayPort) are surrounded by two USB 3.0 ports. The front sports a card reader. The sound of both speakers is surprisingly good. The input devices do not give much reason for complaint. Samsung states 1.3 megapixels for the webcam. The lid and keyboard area are made of aluminum. The all-rounder looks quite elegant owing to the high-end materials. The 17-incher is completely matte. The surfaces are correspondingly insensitive. A DVD burner is used as the optical drive. The multimedia laptop weighs just below three kilograms. 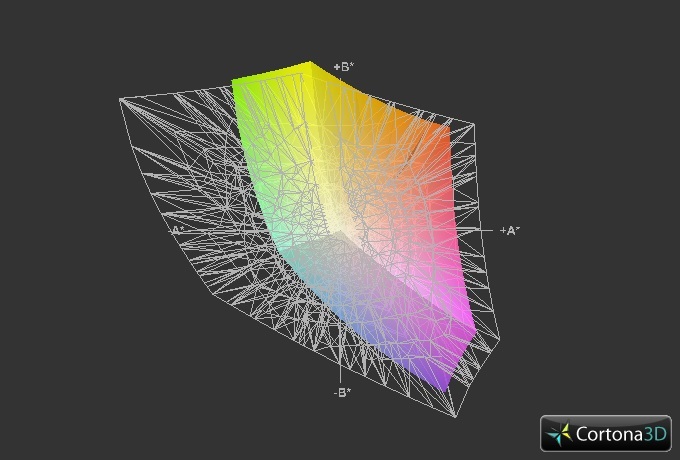 The maximum opening angle is approx. 135°. Despite the powerful components, the 770Z7E only has a height of 27 millimeters. Annoying reflections are mostly thwarted. The workmanship is of a high standard. The connectivity is also above average. The base is only plastic. The handy 90 watt power supply is comfortable to carry around. 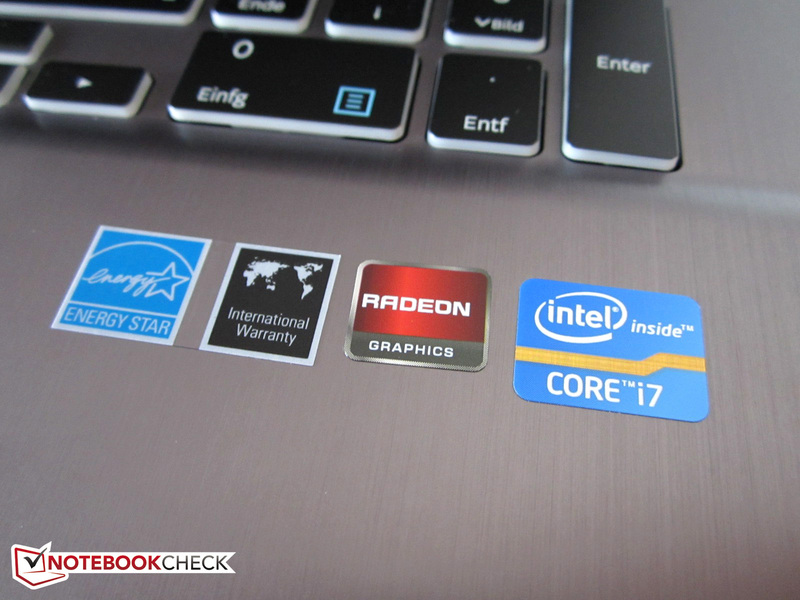 No matter whether components, speakers, design or screen - the laptop compels in almost every category. A more stable clock behavior and a directly accessible battery. Striking weaknesses? Not in the Chronos 770Z7E. 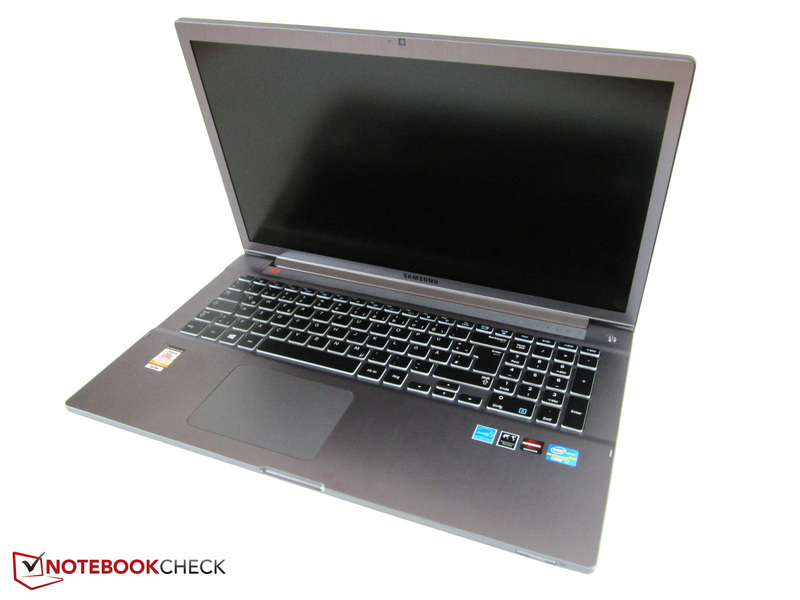 17-inch all-round or gaming laptops with a lot of graphics power, such as Acer Aspire V3-771G, Asus N76VZ, Clevo W370ET Barebone (Schenker XMG A722 & One K73-2O), Dell Inspiron 17R, One M73-2O, MSI GE70 or Samsung 700Z7C.